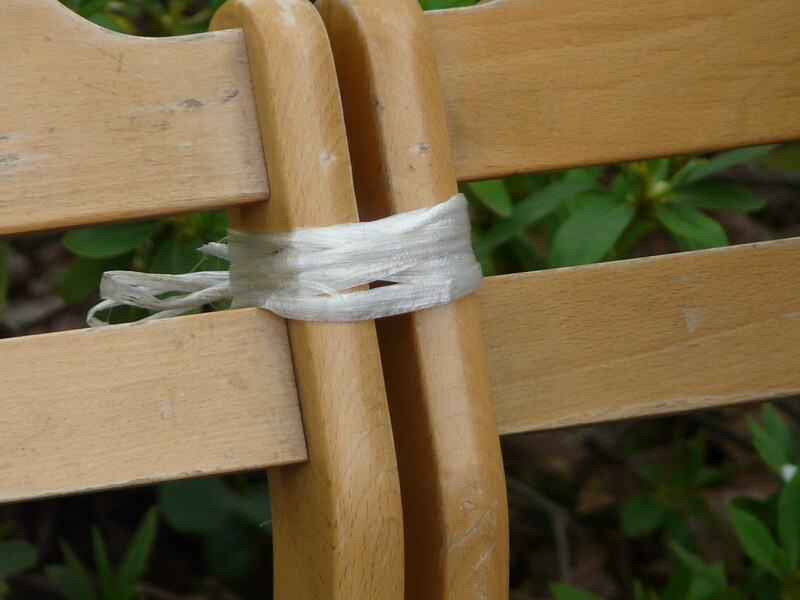 Park bench constructed from household seating and plastic twine. 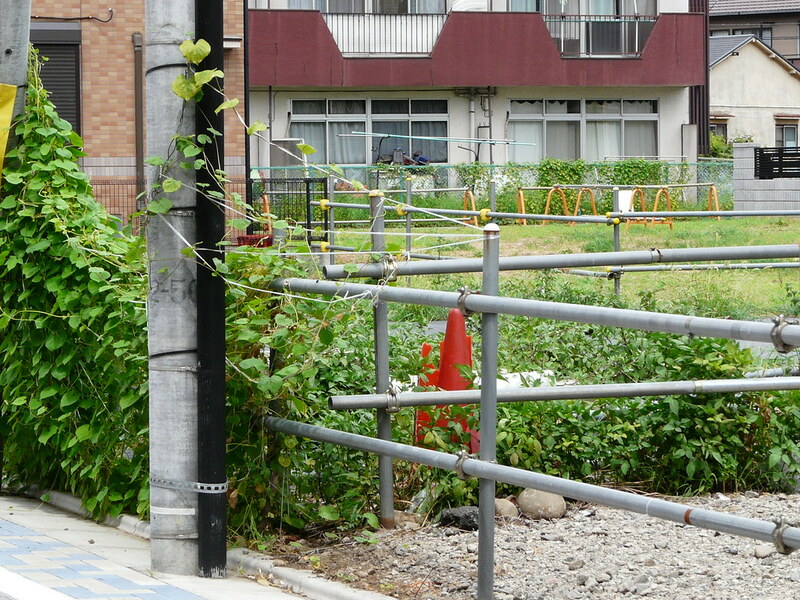 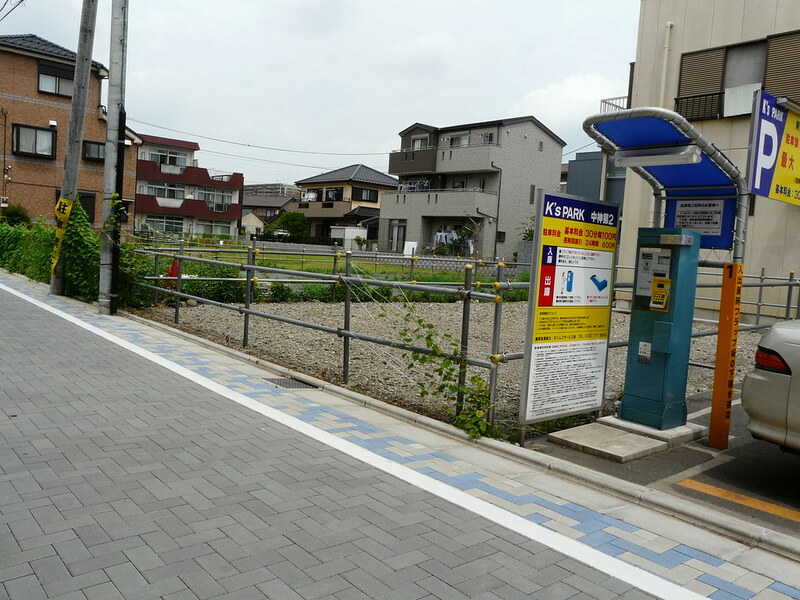 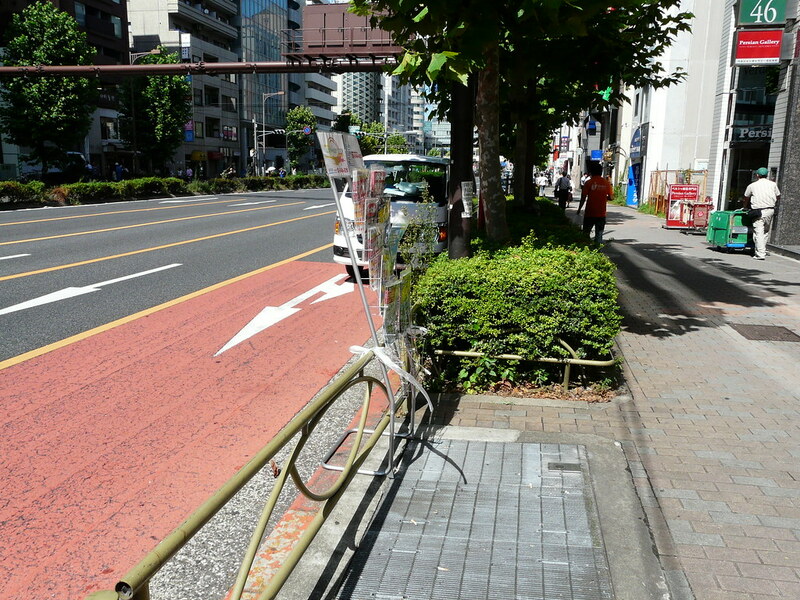 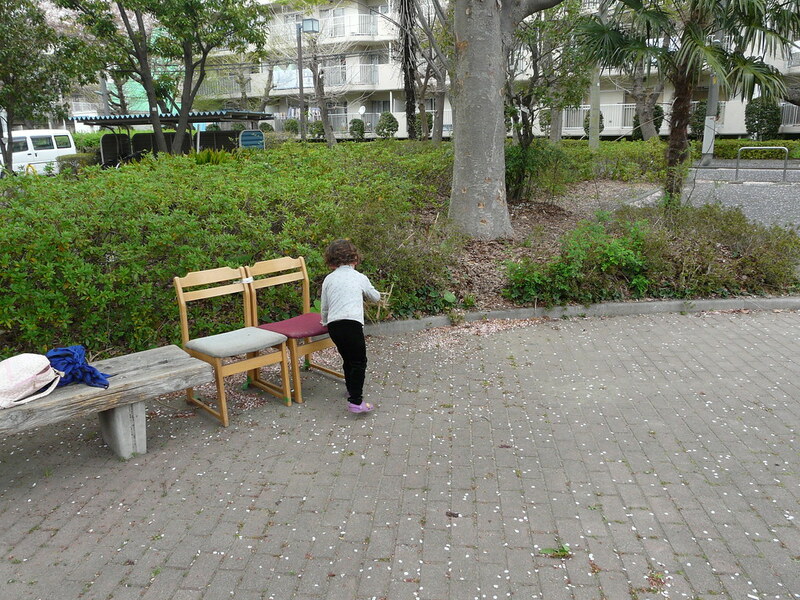 See “Bus stop chairs are gifted, unmatched, and spontaneous” for an insightful take on the subject (on Tokyo Green Space). 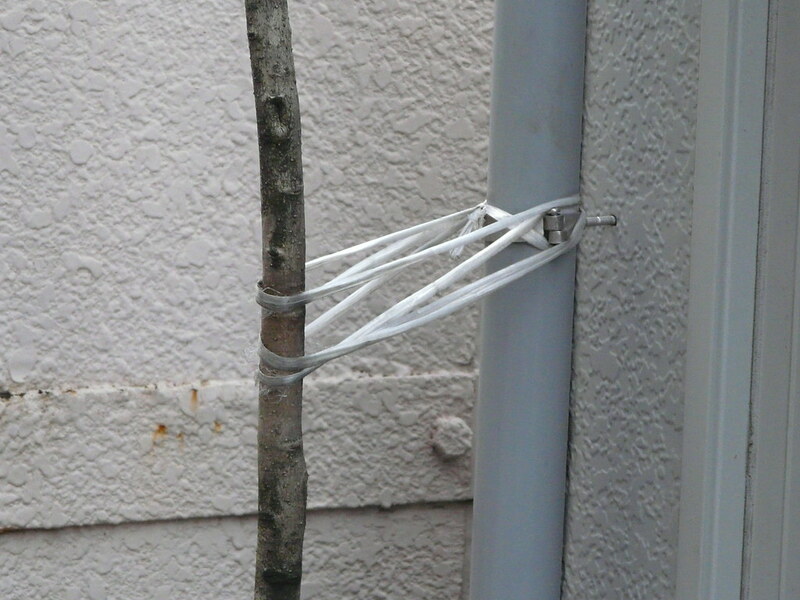 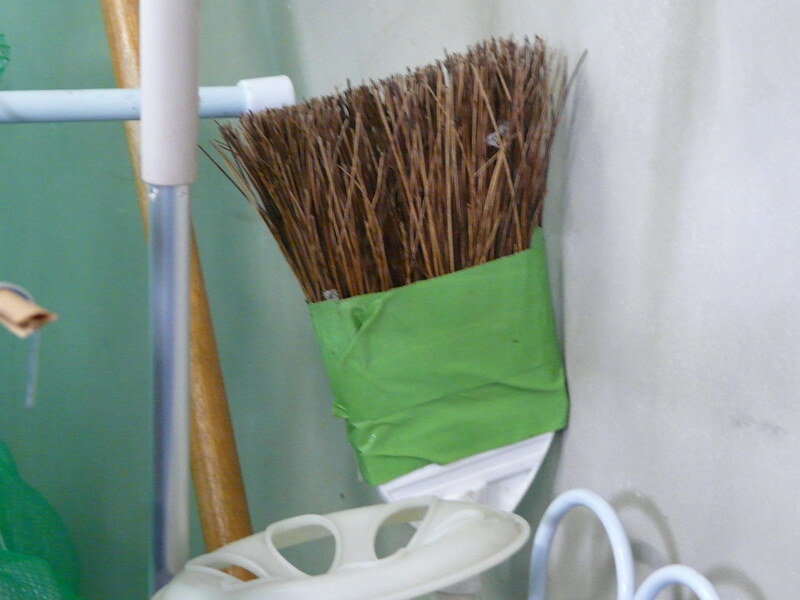 Simple hanger made of Tokyo DIY essentials plastic twine and s-hooks (Tokyo’s superglue) keeps onions tasty in early autumn. 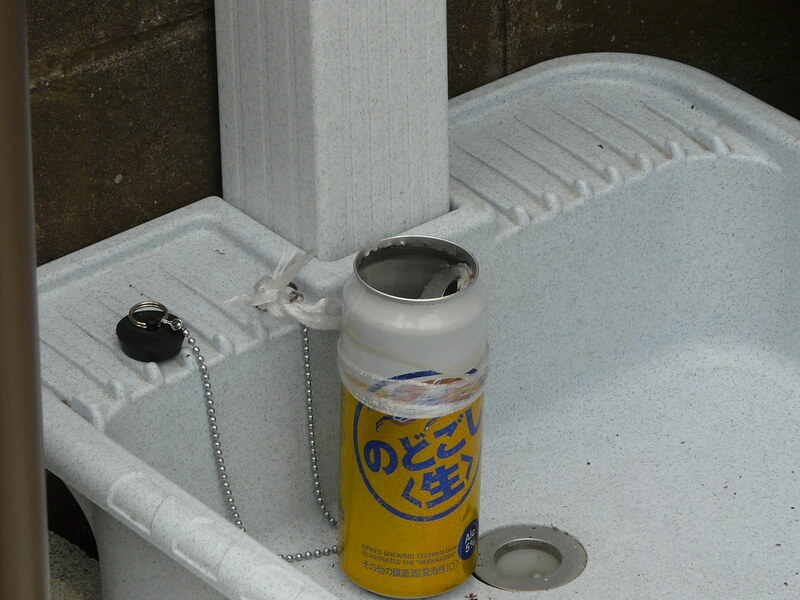 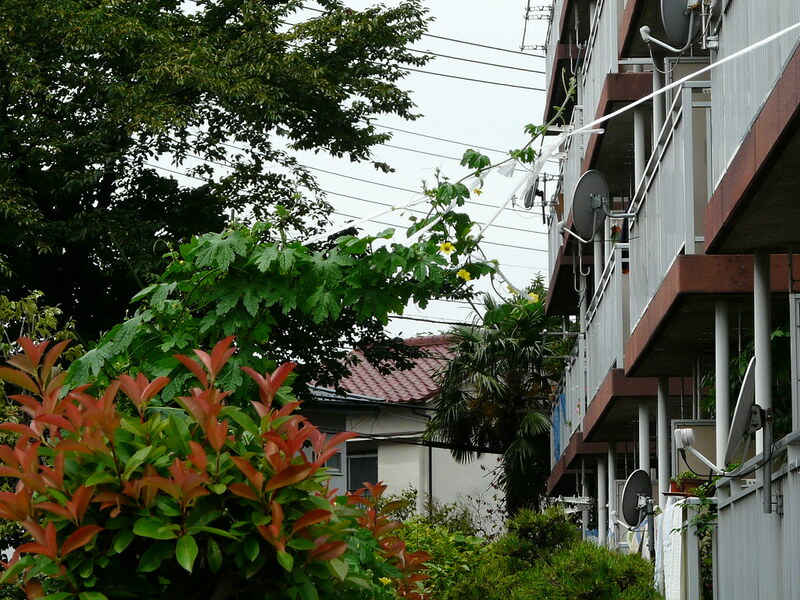 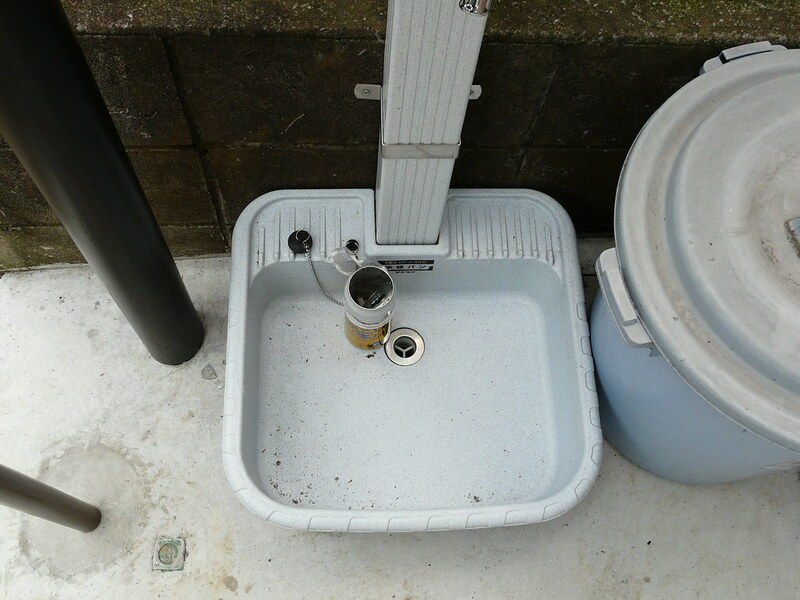 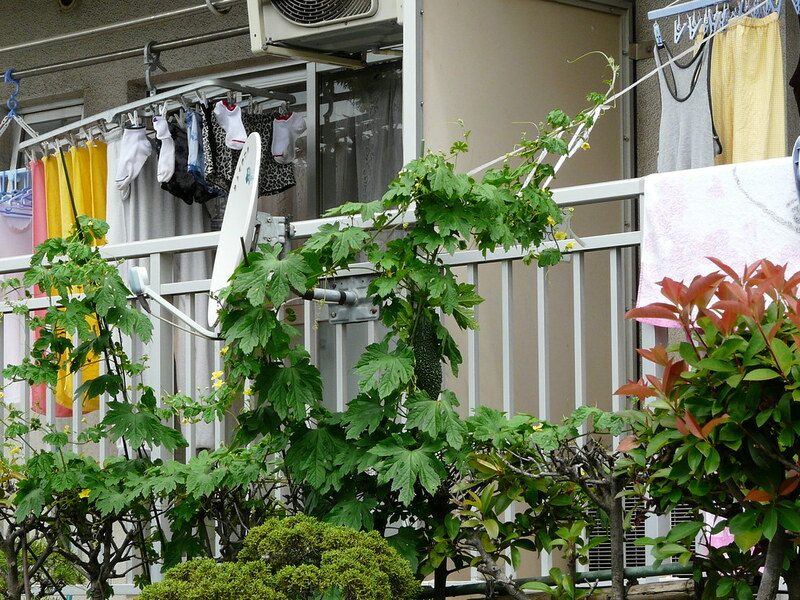 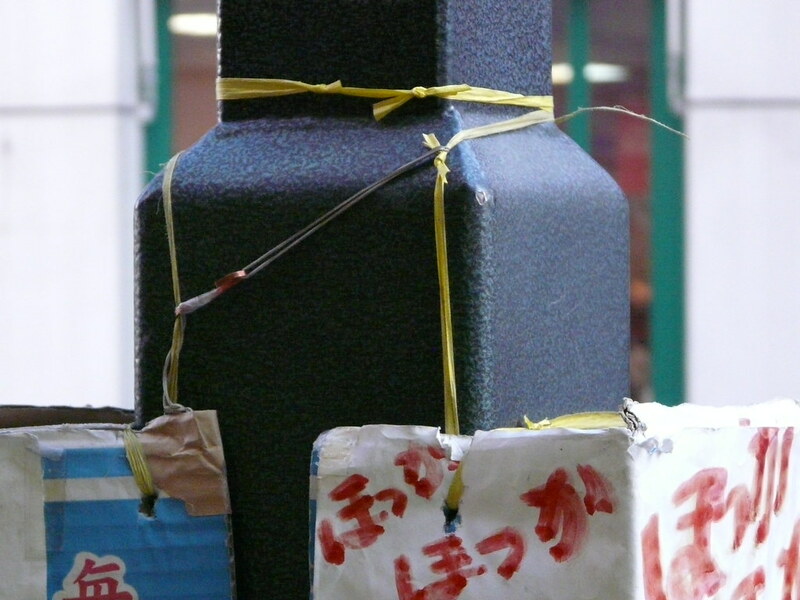 Tokyo based design researcher Celine Mougenot introduces this great DIY sound system spotted in Okinawa. 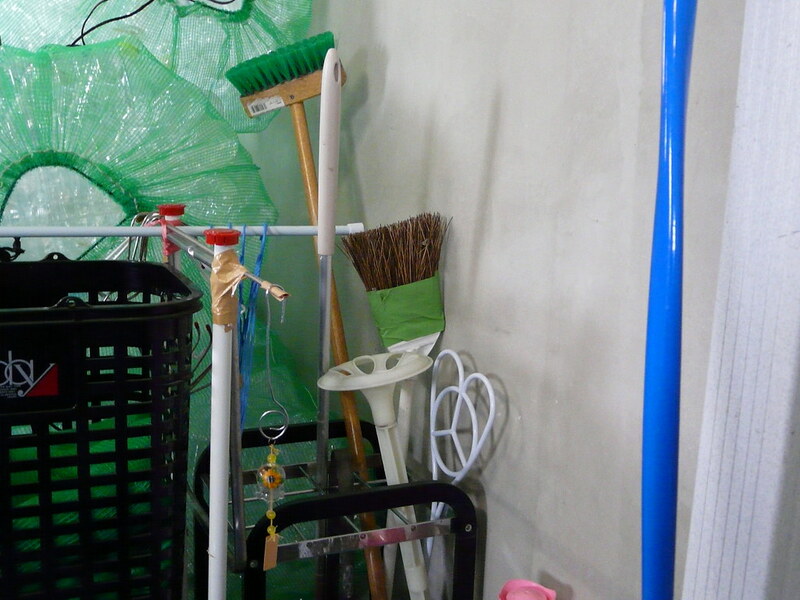 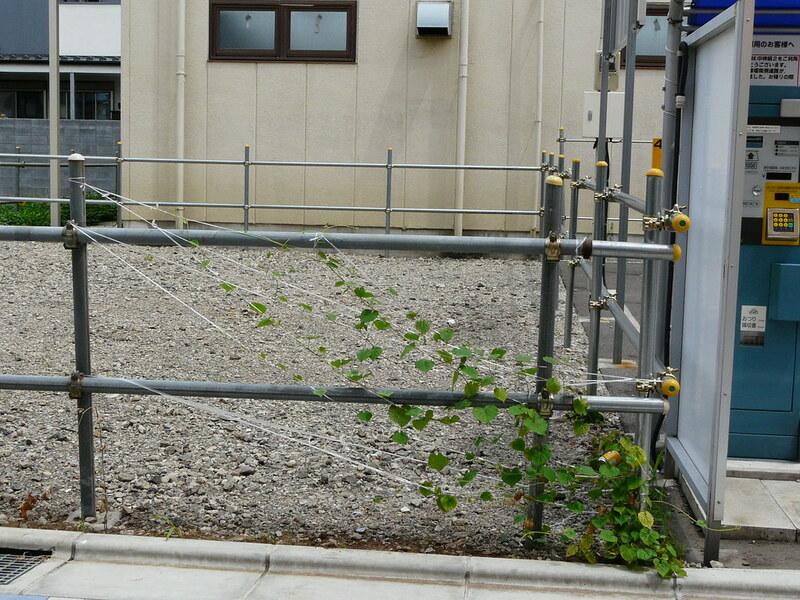 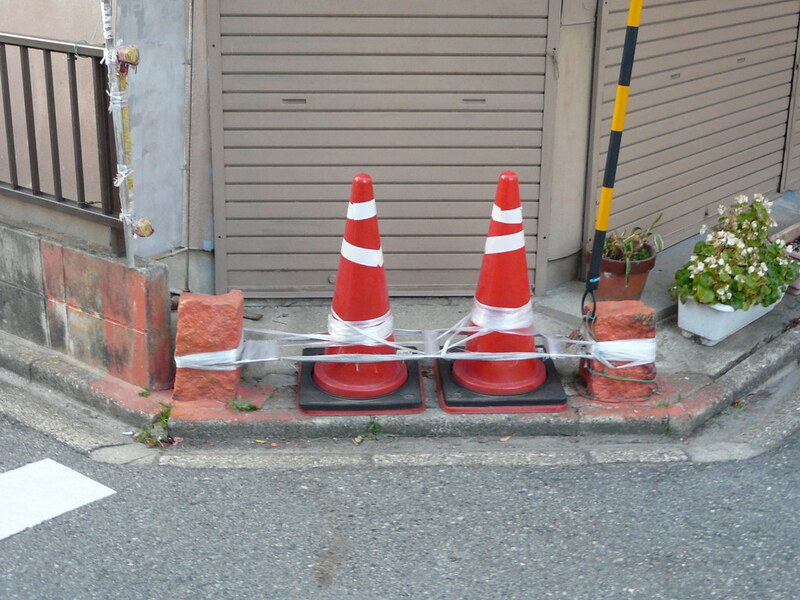 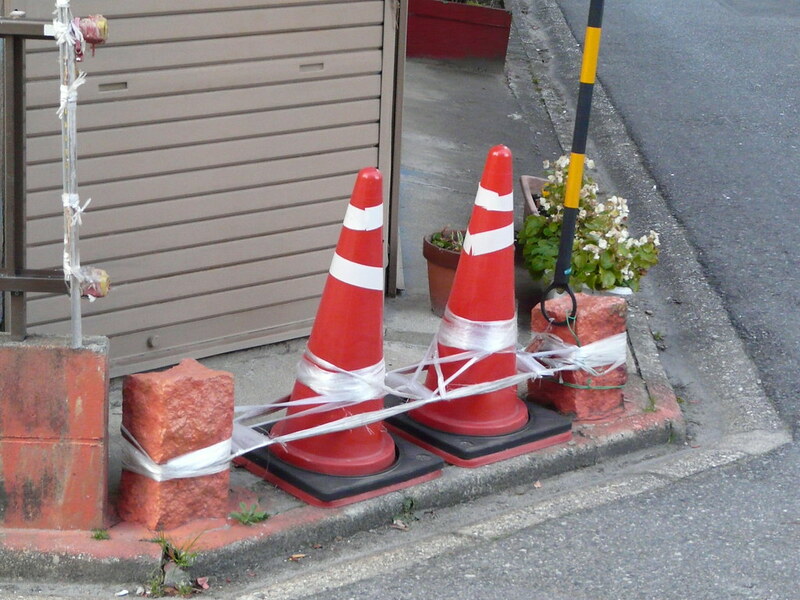 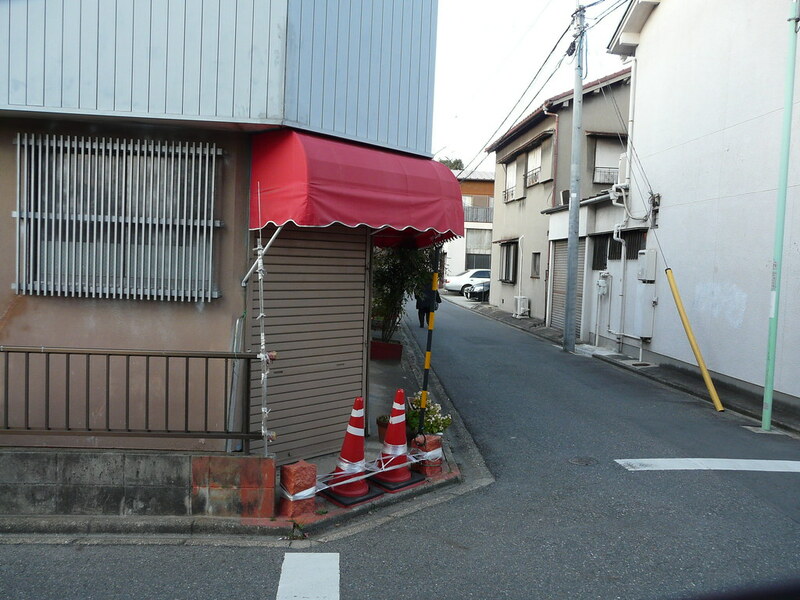 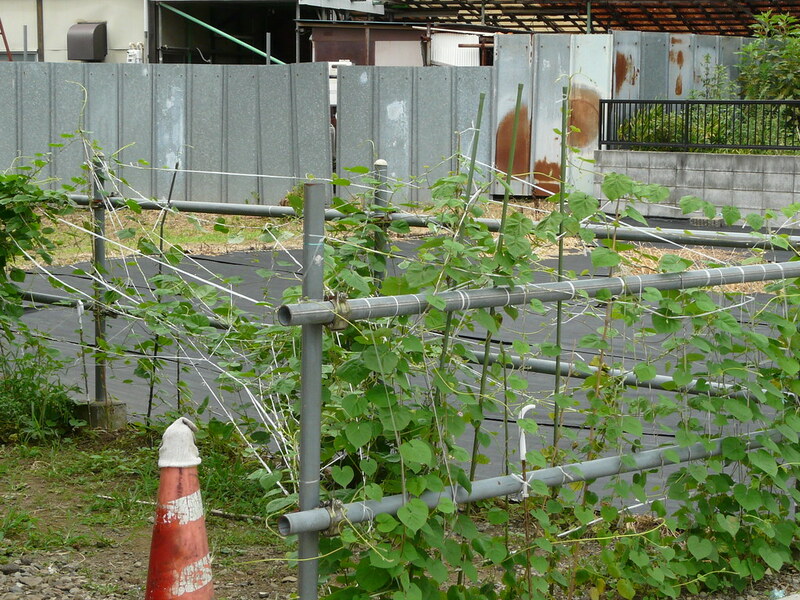 A construction of traffic cones and barriers held together with wire and plastic twine supports an old awning and cordons off the unused shop front. 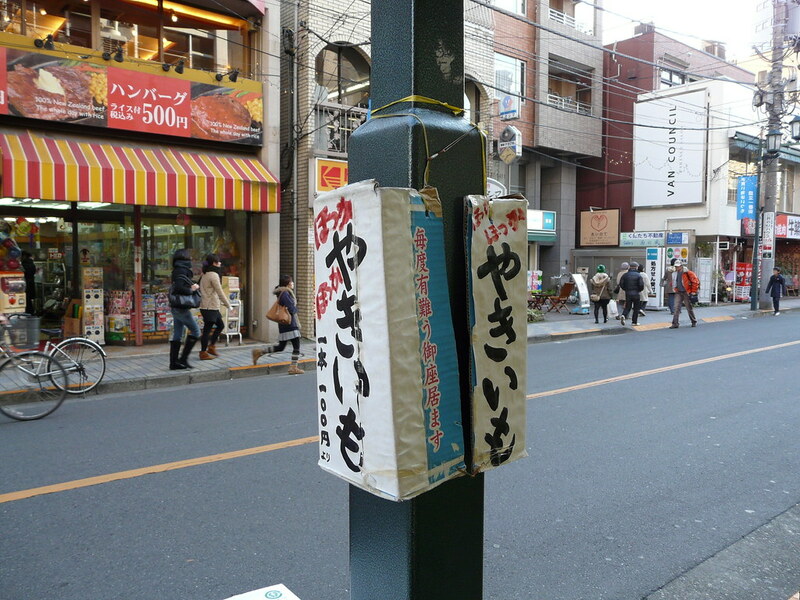 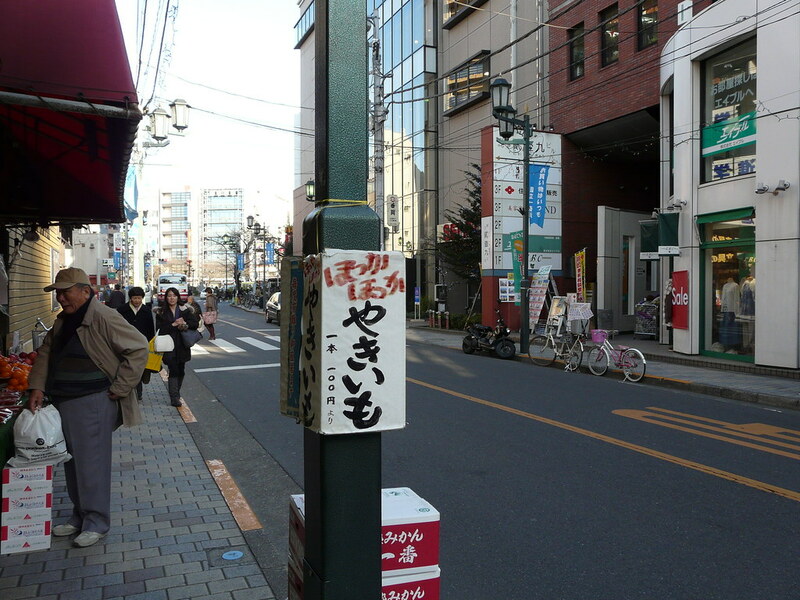 Yaki-imo (roasted sweet potato) advertisement on lamppost. 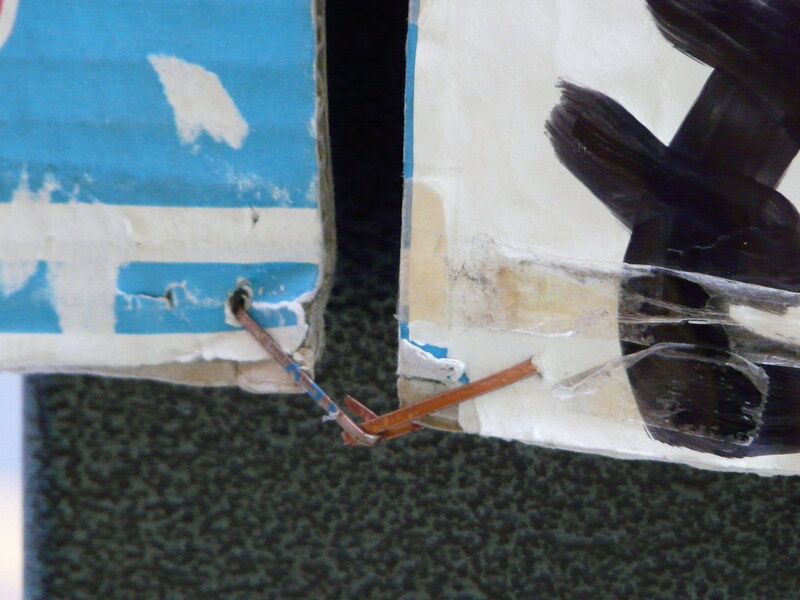 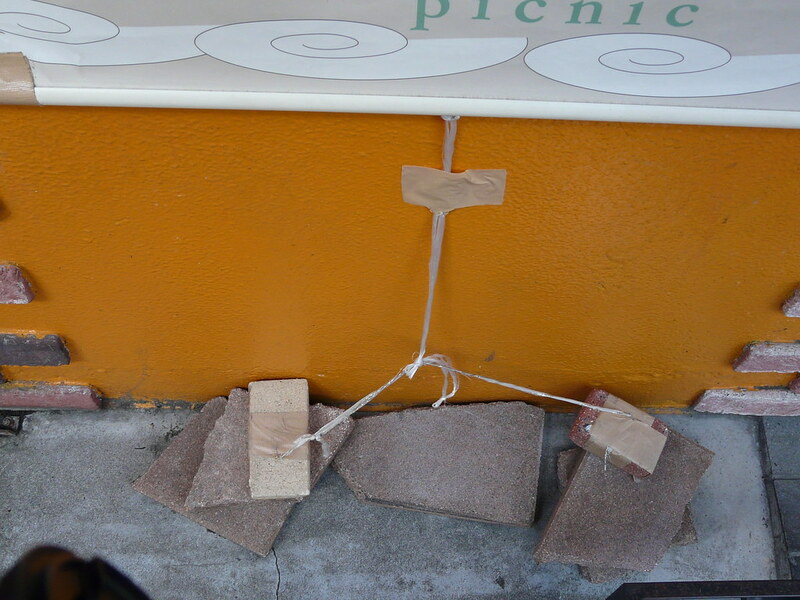 Constructed of a cardboard box, plastic twine, and wire ties. 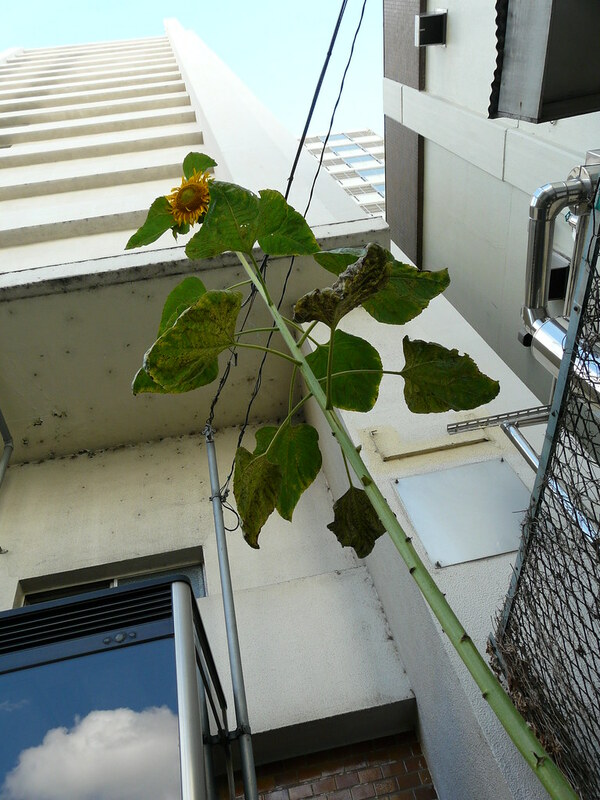 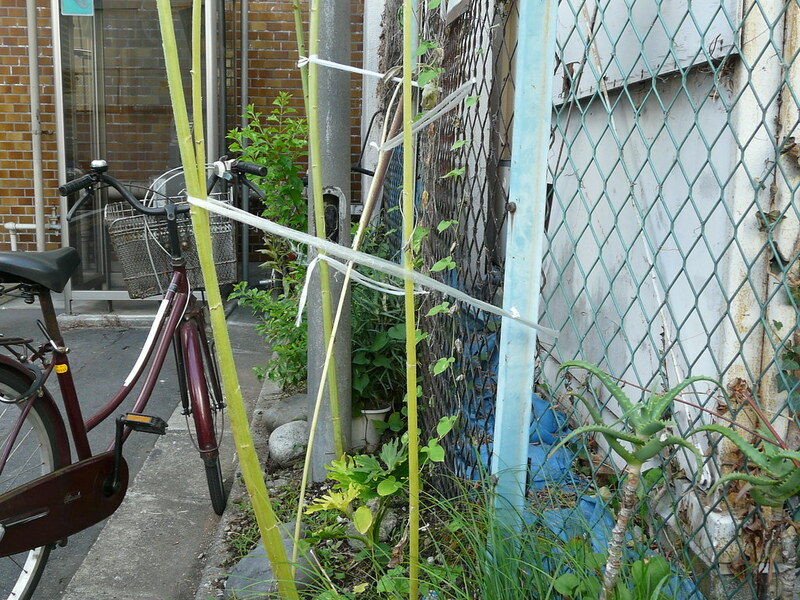 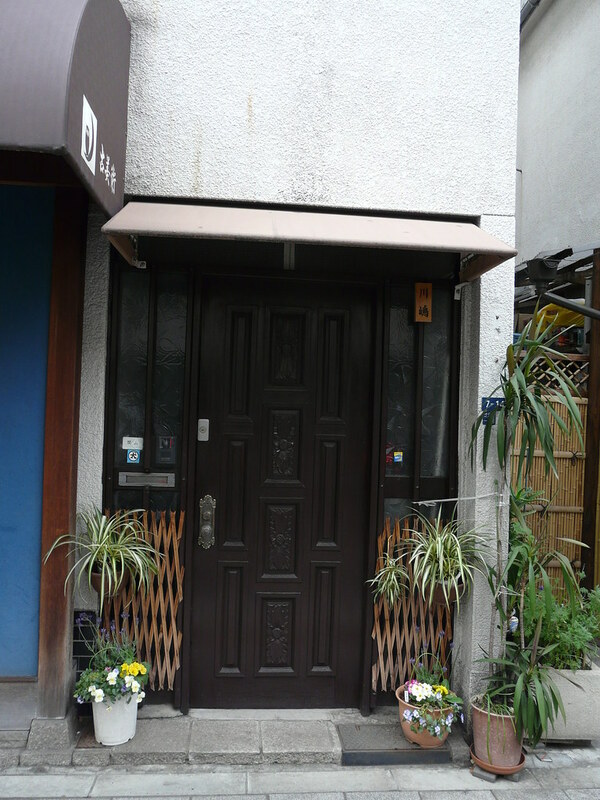 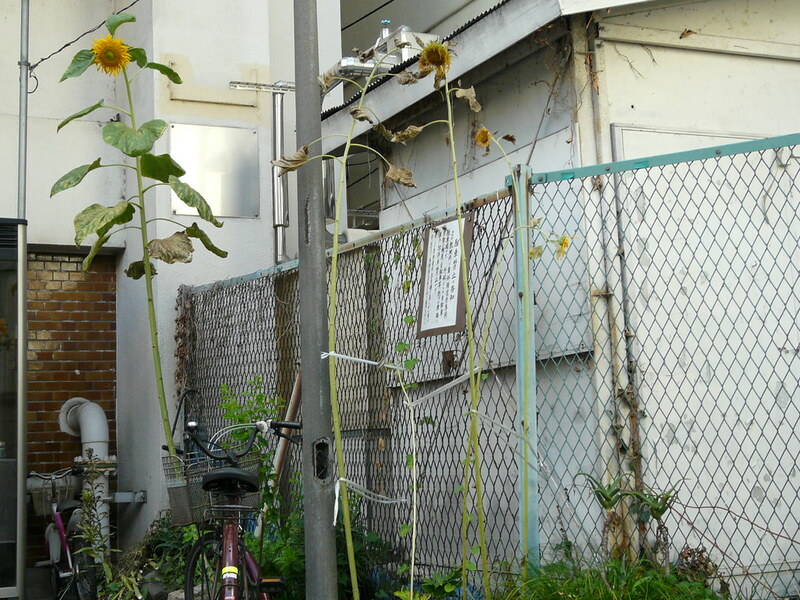 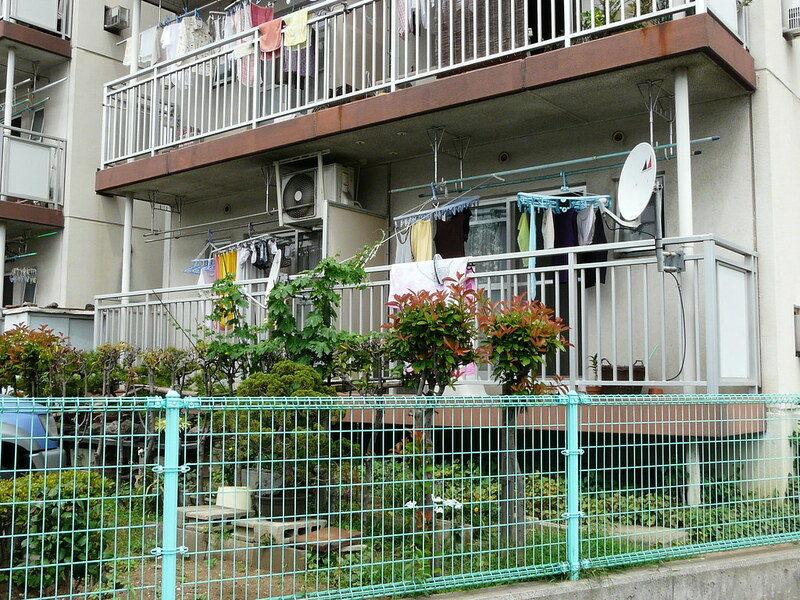 As I rode my kick scooter across Tokyo from Shibuya to Ochanomizu, on the way to the Tokyo Mapping Workshop in the heat of summer I turned a corner in a deserted backstreet and ran straight into these monsters…… so tall they need to be tethered to the chain link fence for support as they wither. 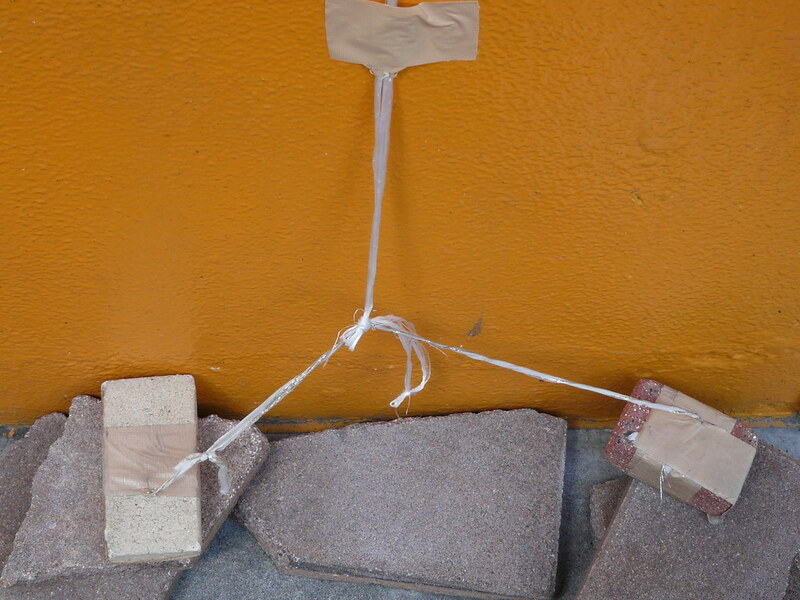 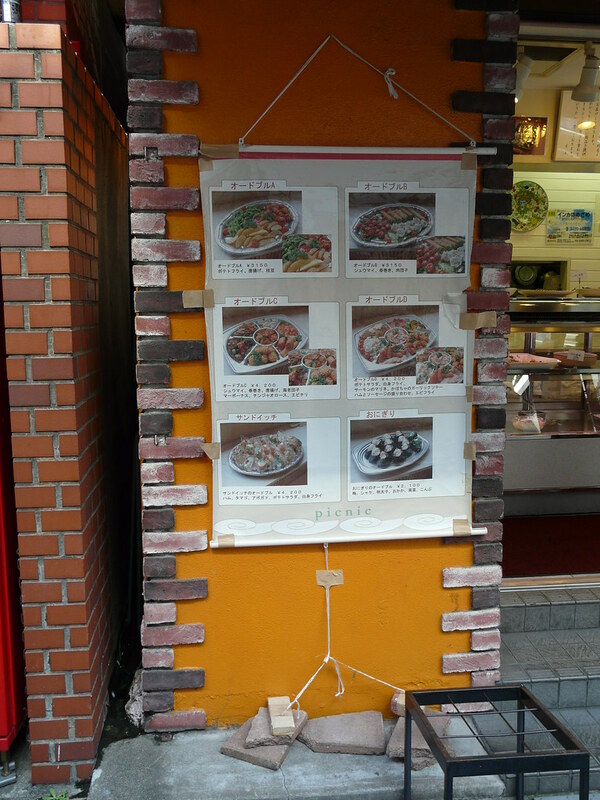 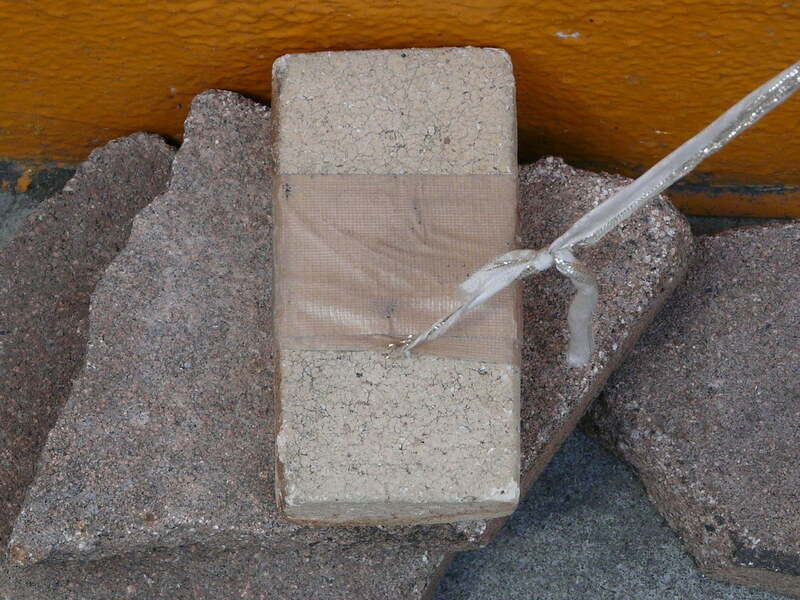 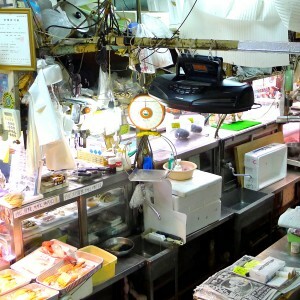 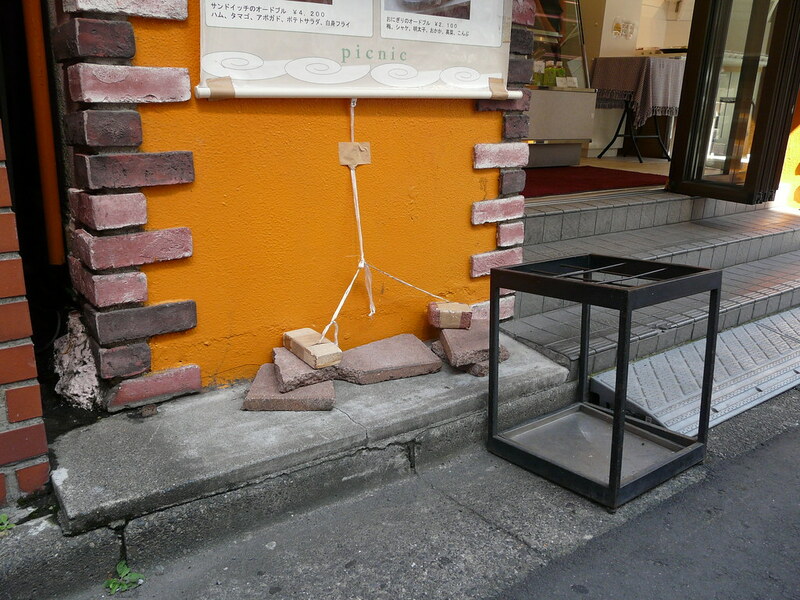 The outdoor menu for this food store is secured with plastic twine taped to two bricks, the base evened out with broken paving tiles. 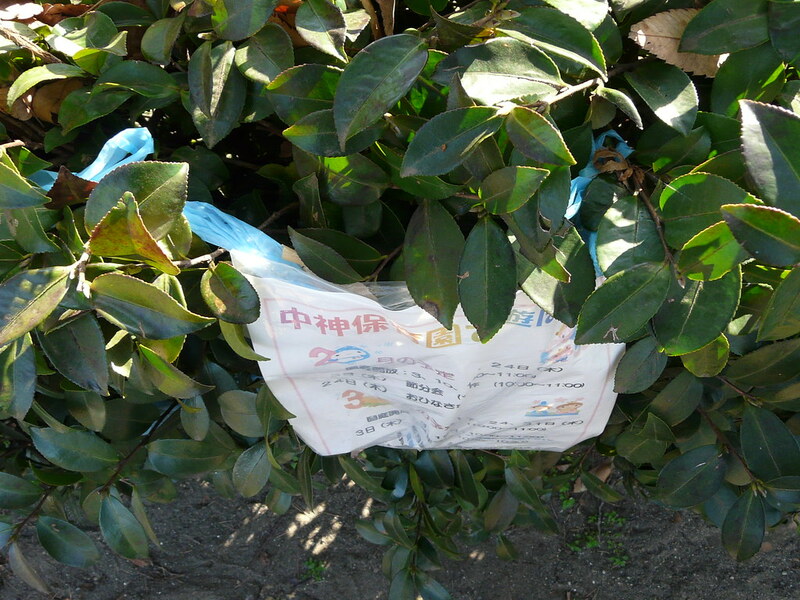 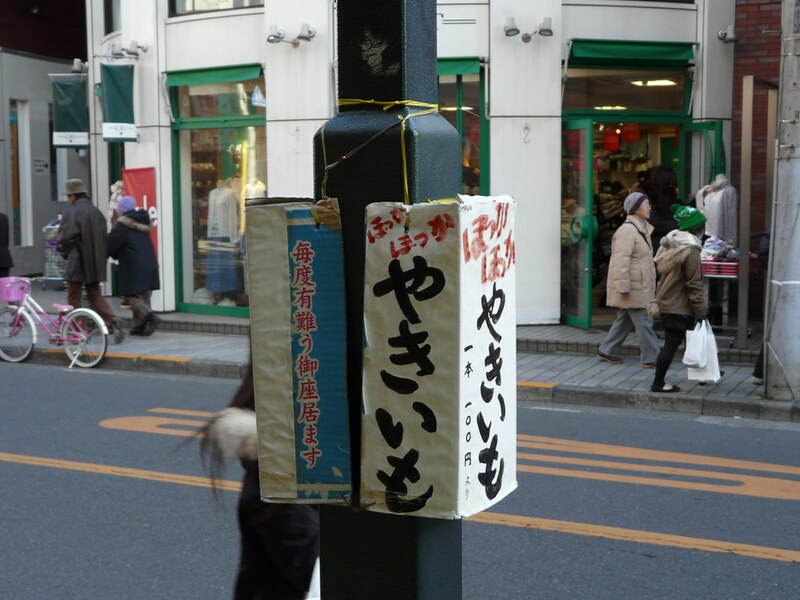 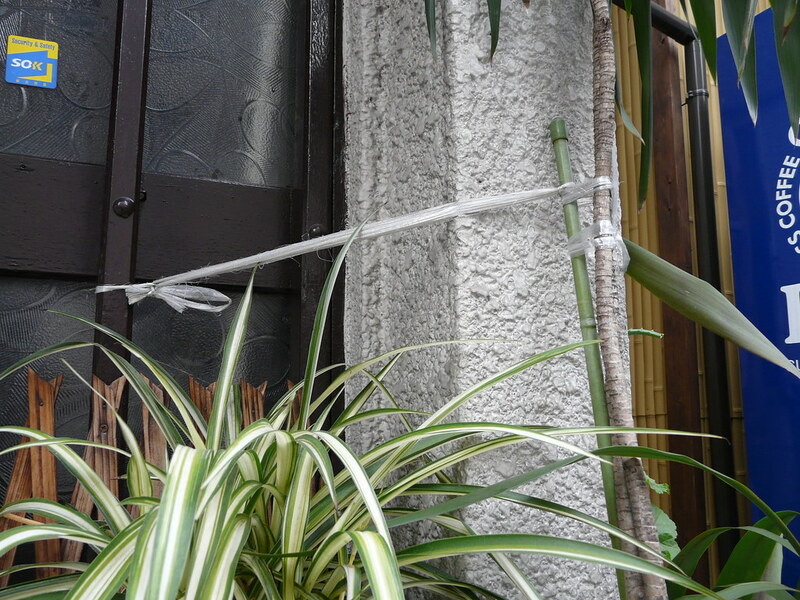 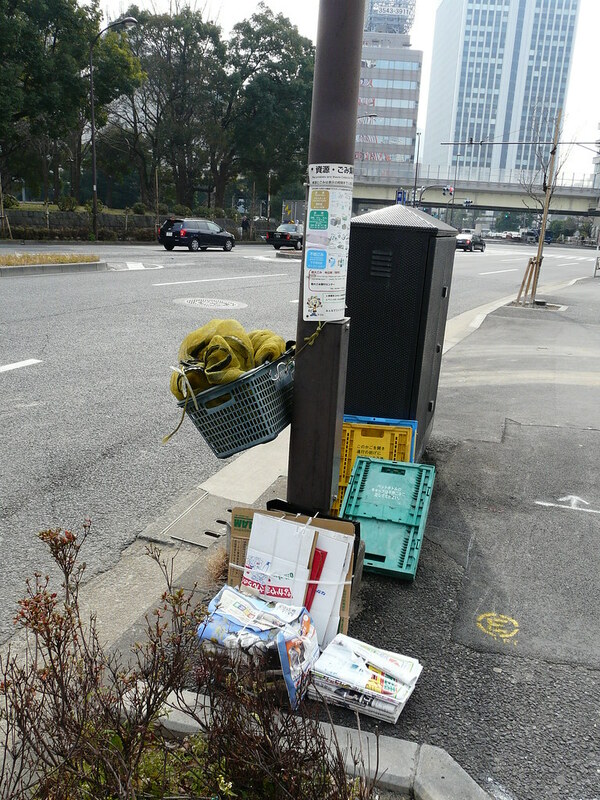 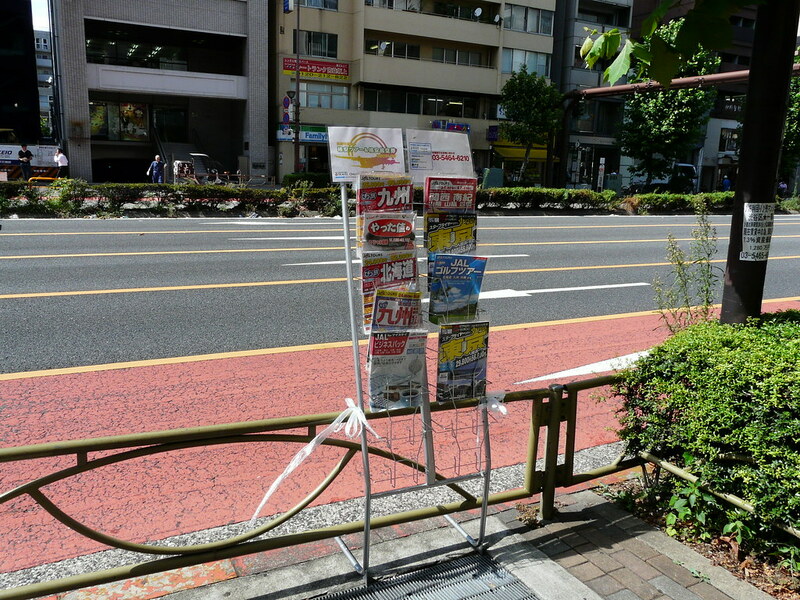 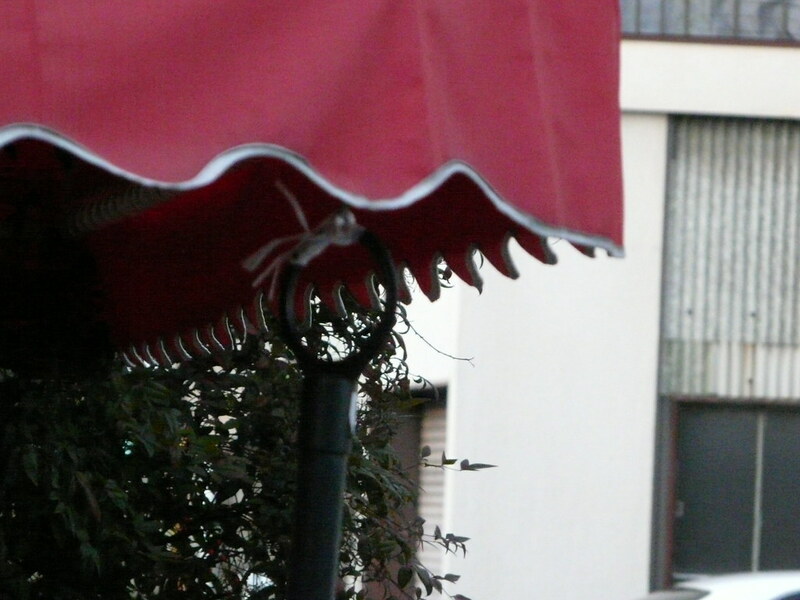 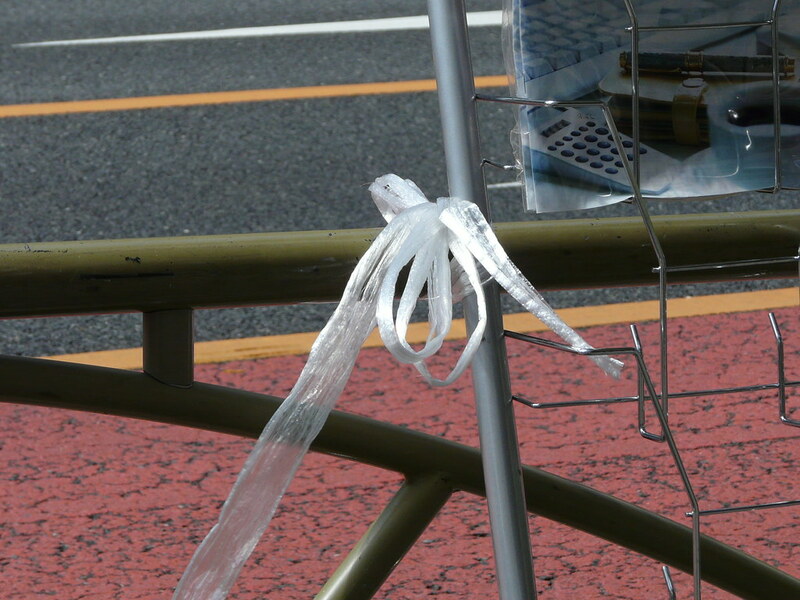 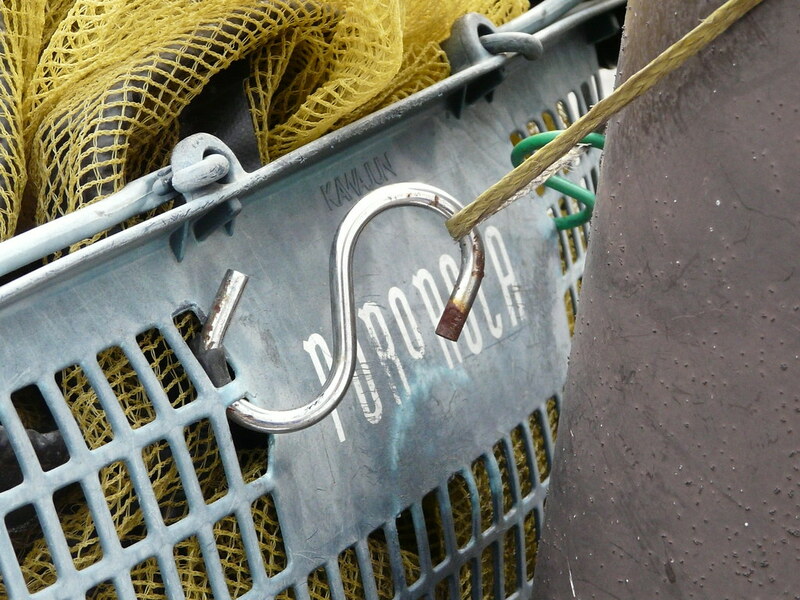 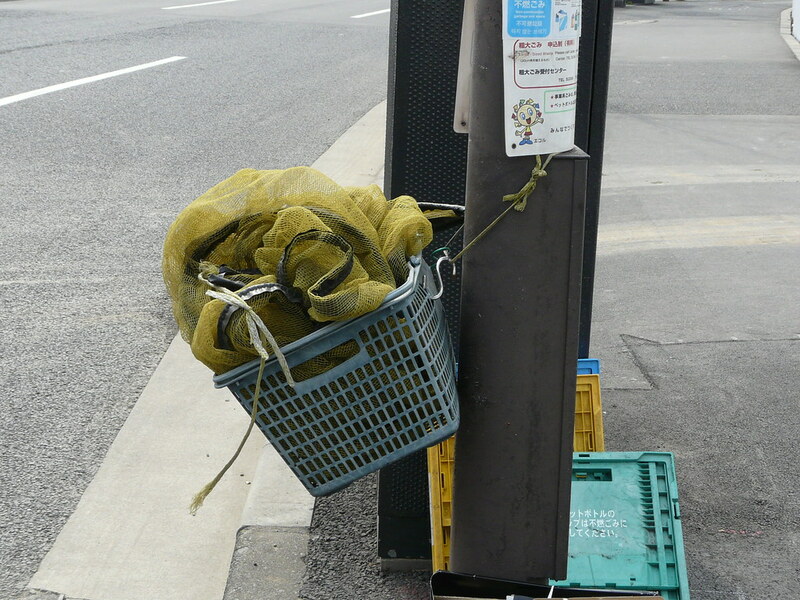 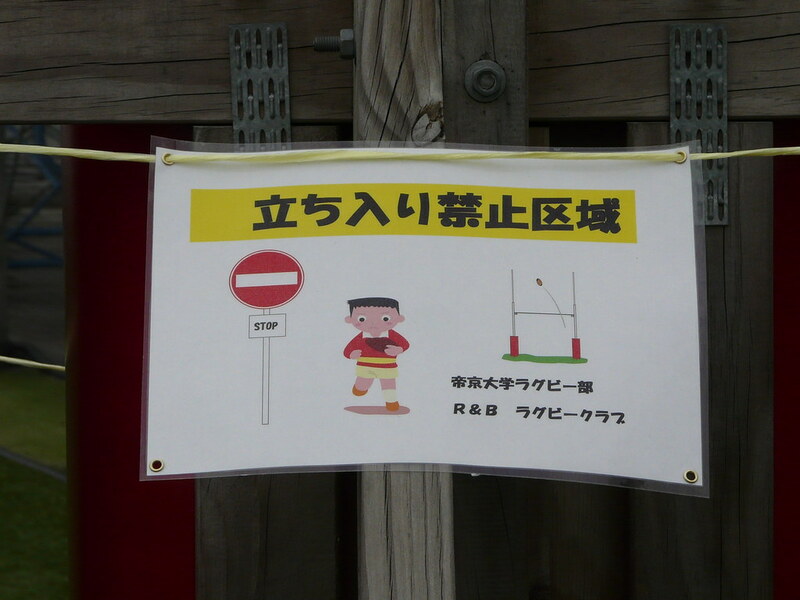 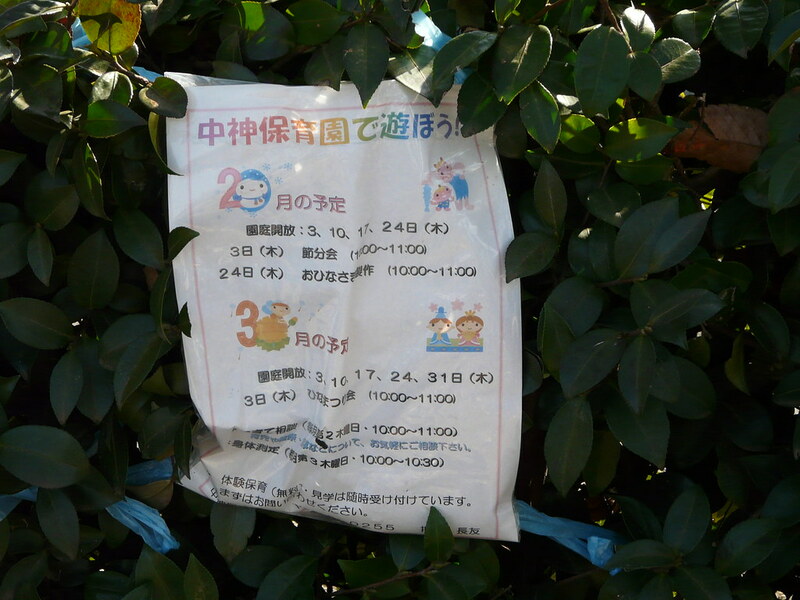 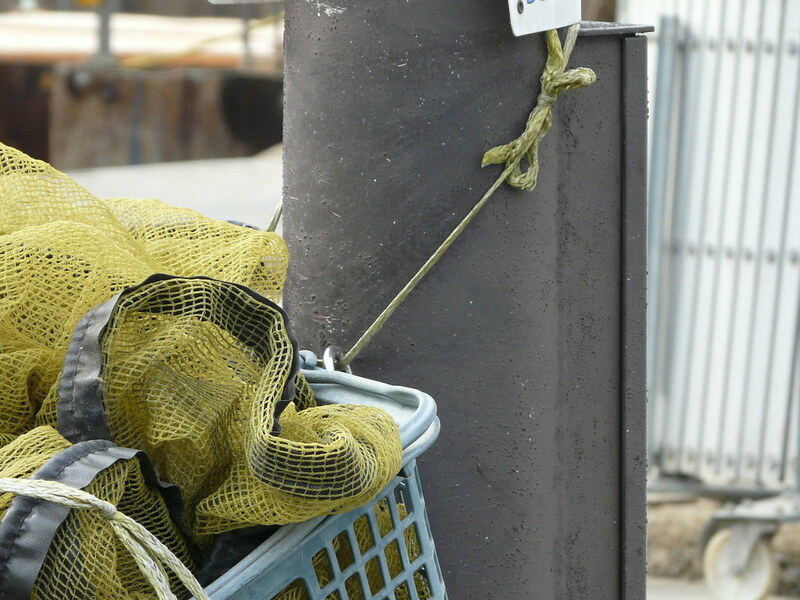 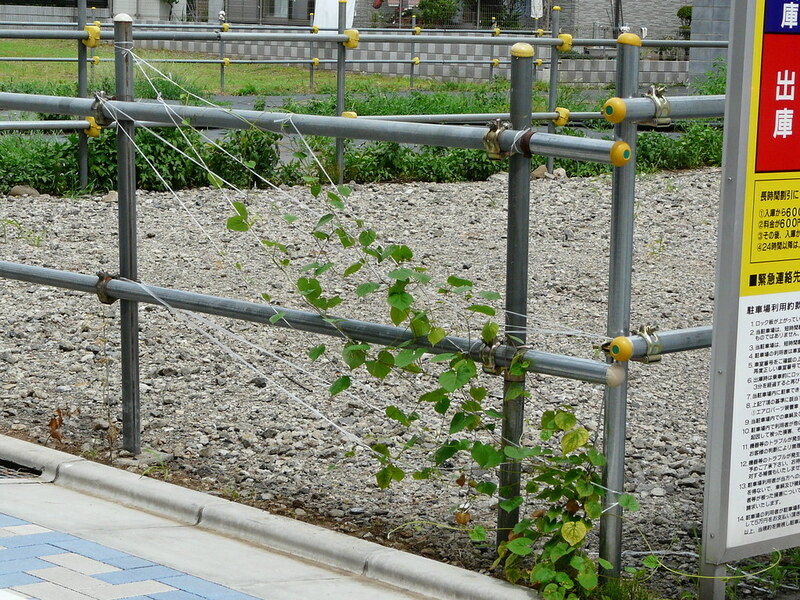 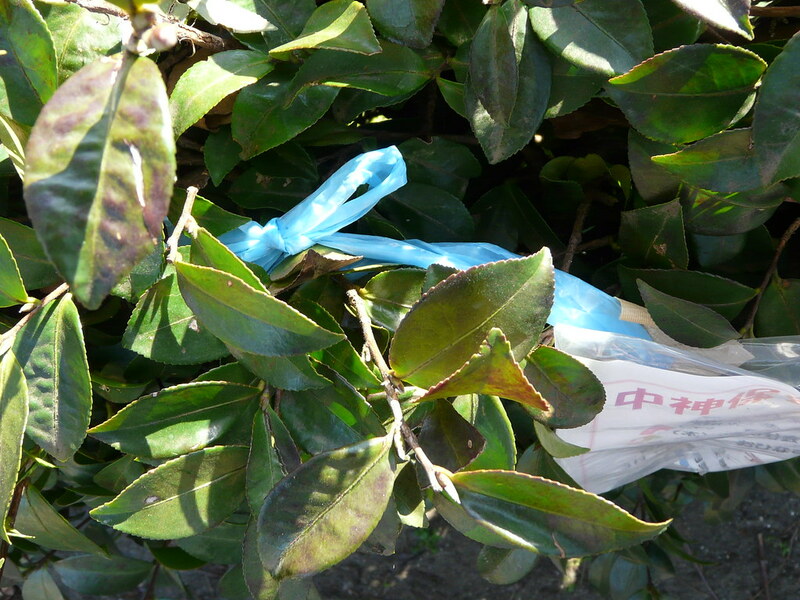 Pamphlet stand outside during business hours – tied to the pedestrian railing with plastic twine for stabilisation. 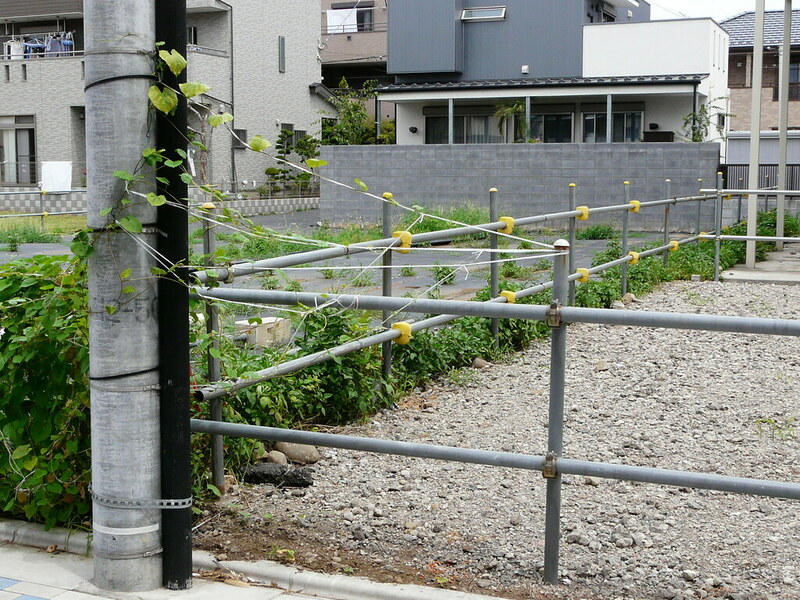 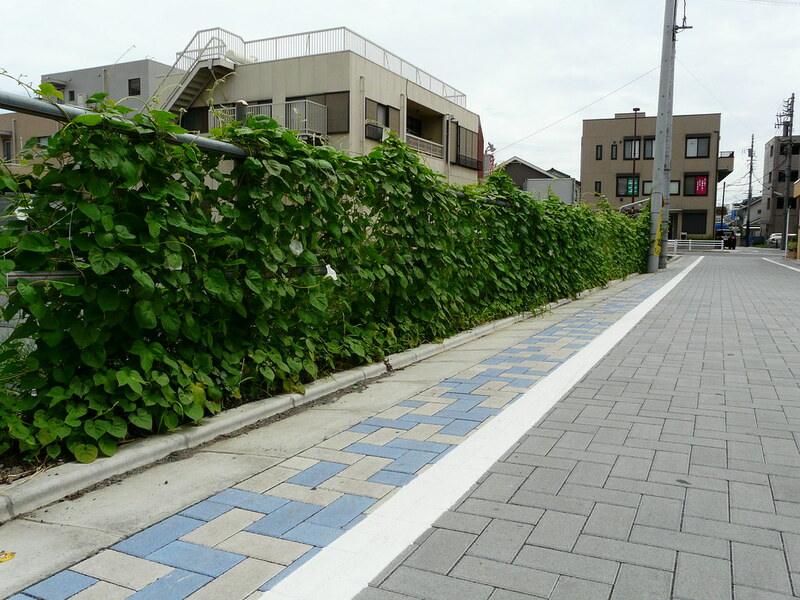 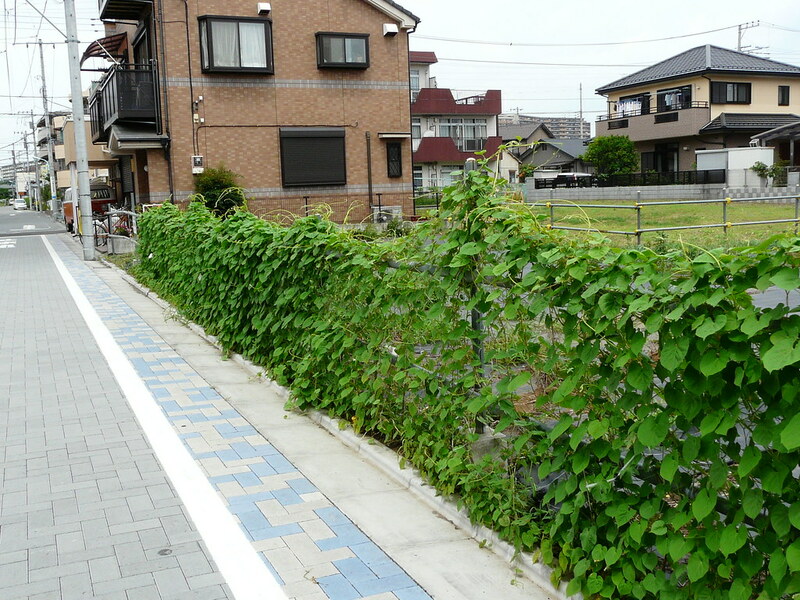 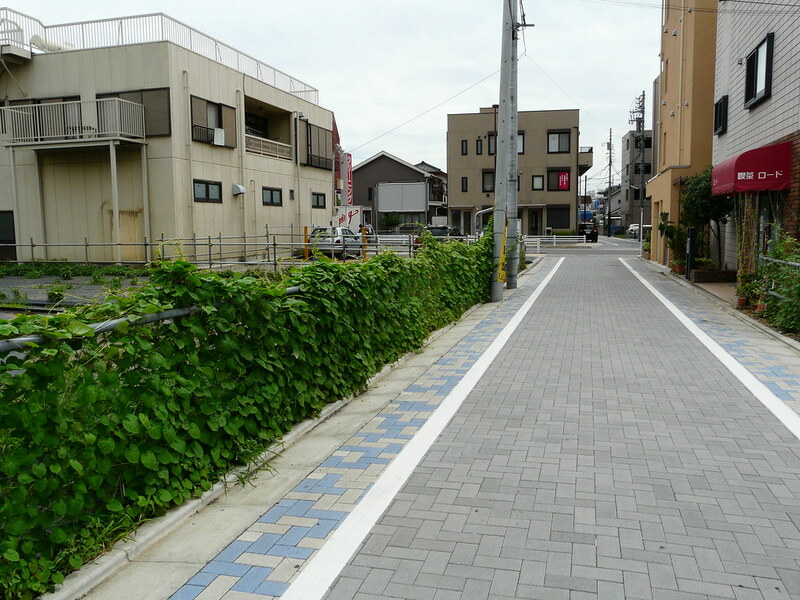 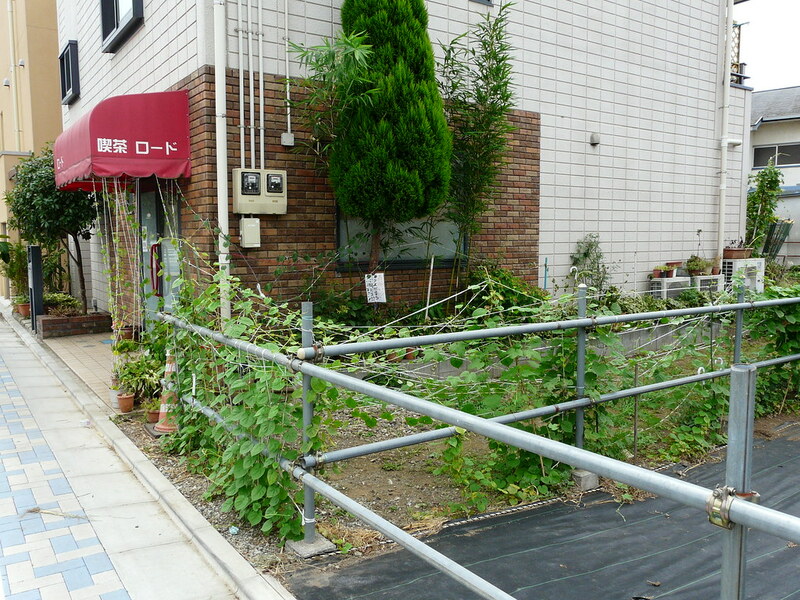 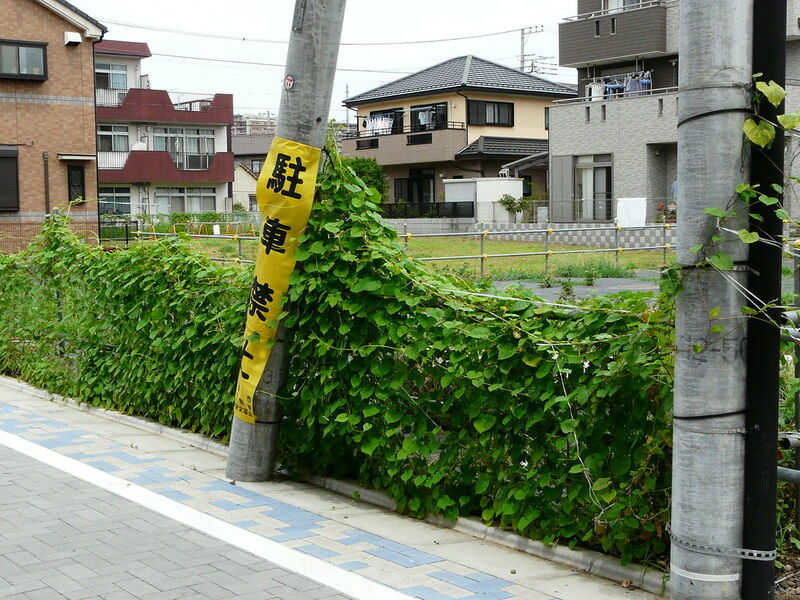 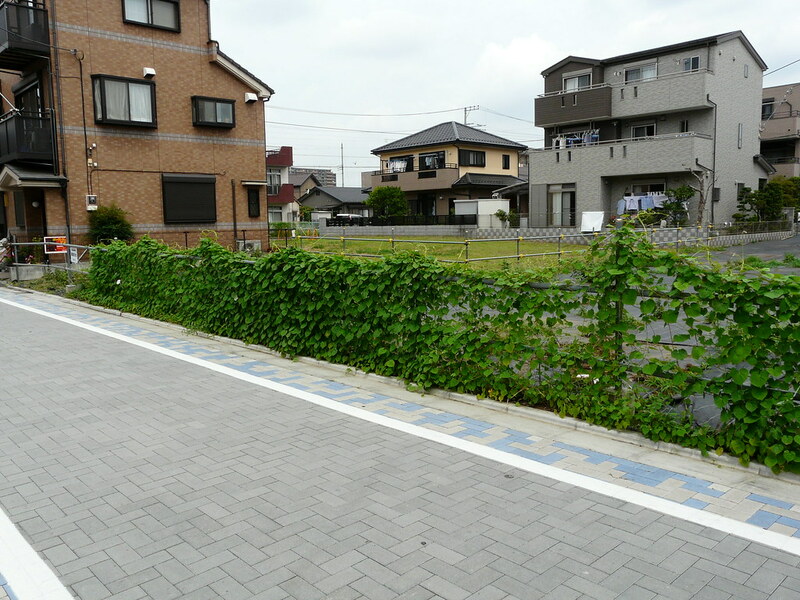 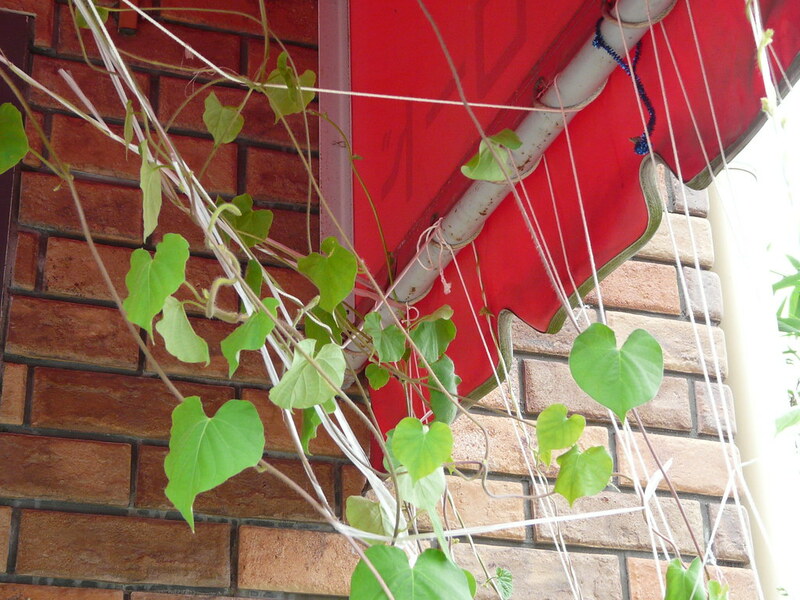 Using many metres of plastic twine, a local coffee shop owner has trained a flowering creeper up and down both sides of the paved lane outside their shop. 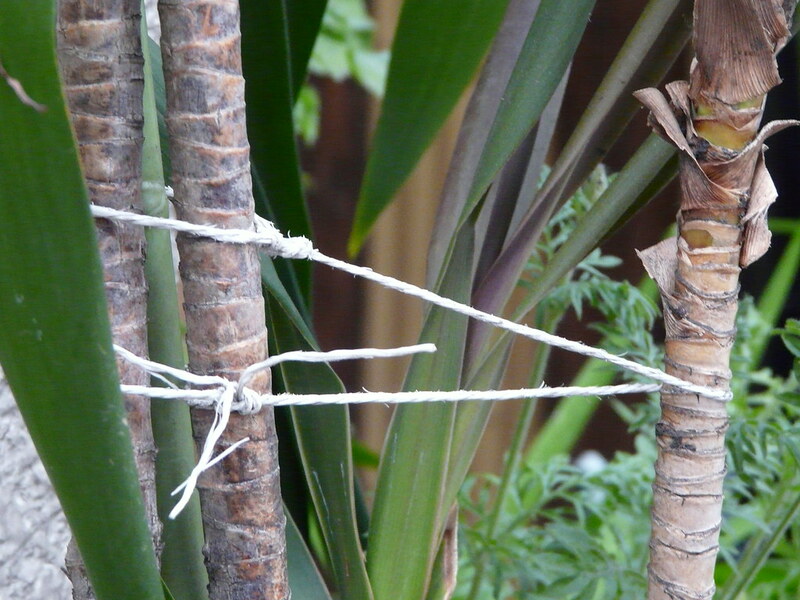 Even though seemingly random, the complex web of twine takes a non-trivial amount of time, thought and effort to construct. 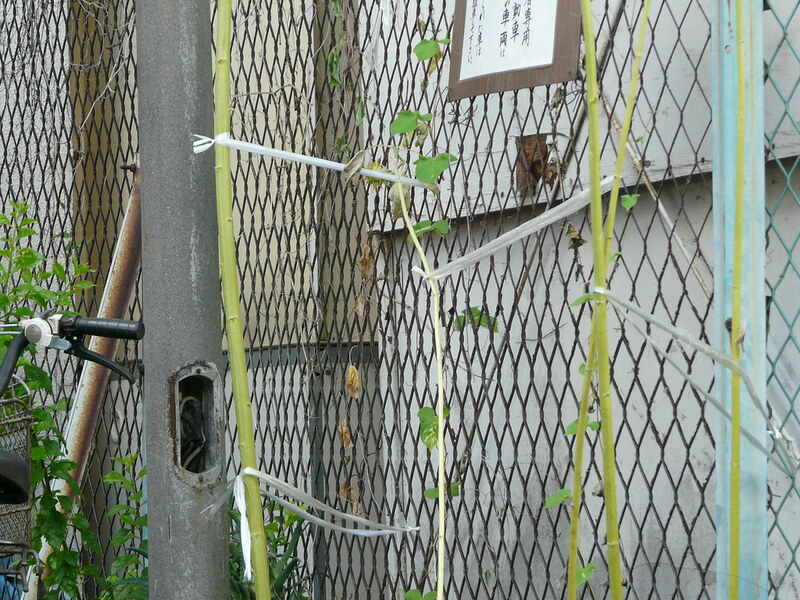 The web has been prepared to guide an independent creeper along the fence line of a vacant lot, creating a lush green waist high curtain. 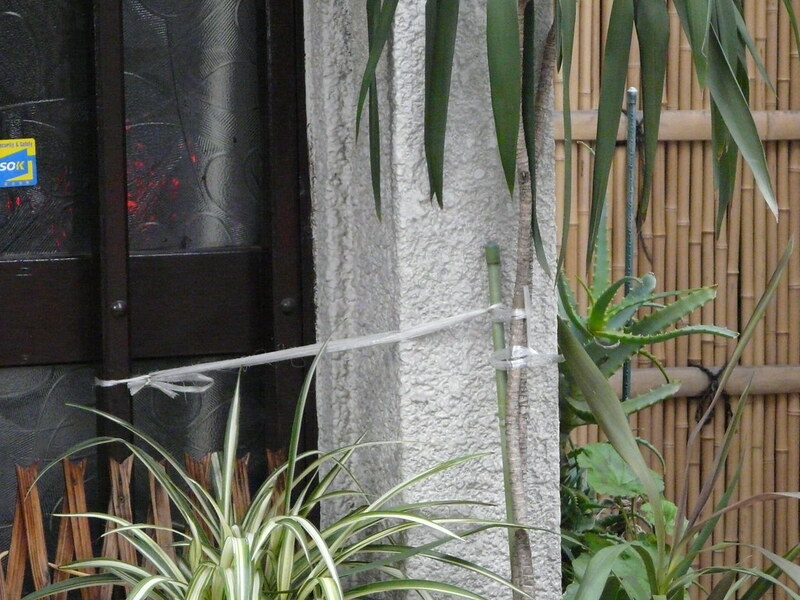 I especially like the way the corners have been densely woven (images 8,9,10), enabling thick growth and thus a cool and shady habitat for insects, cats and other animals. 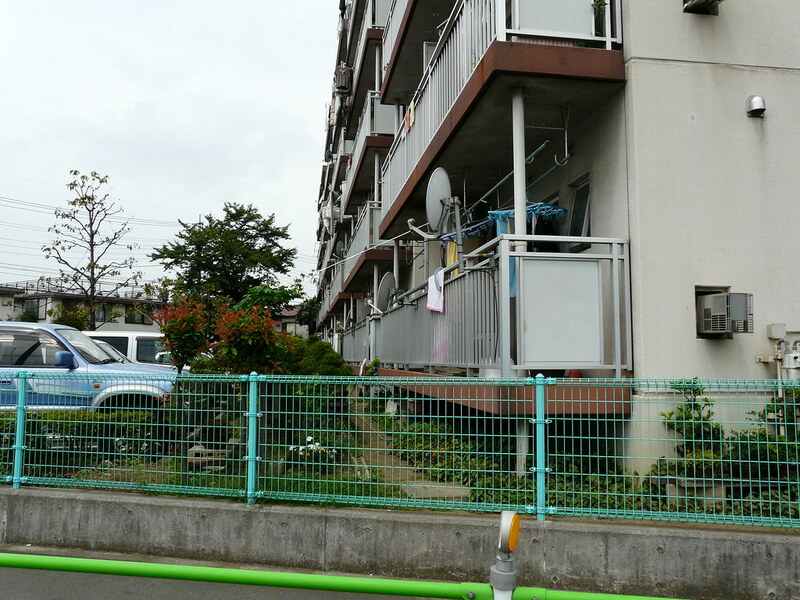 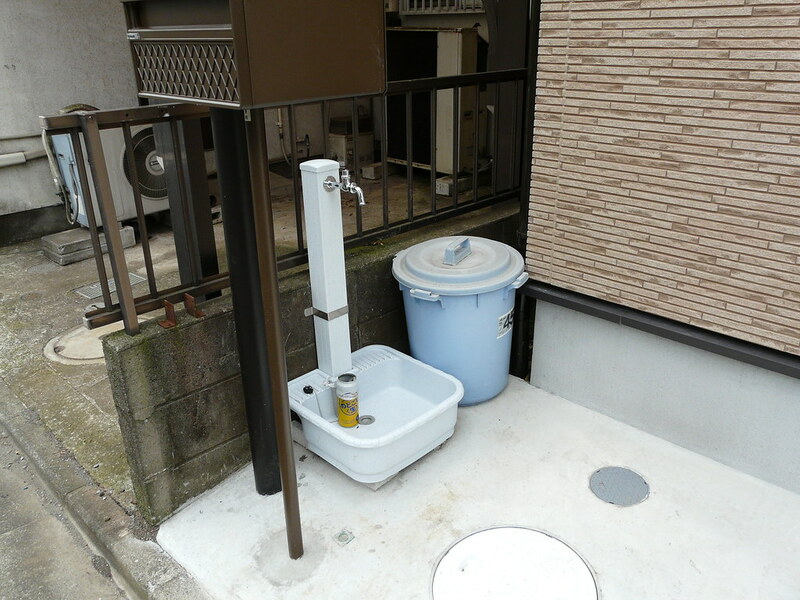 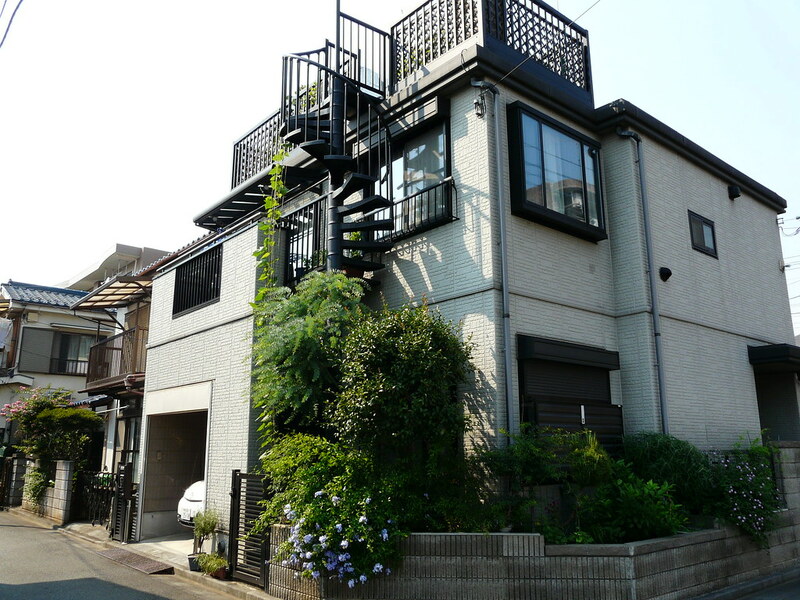 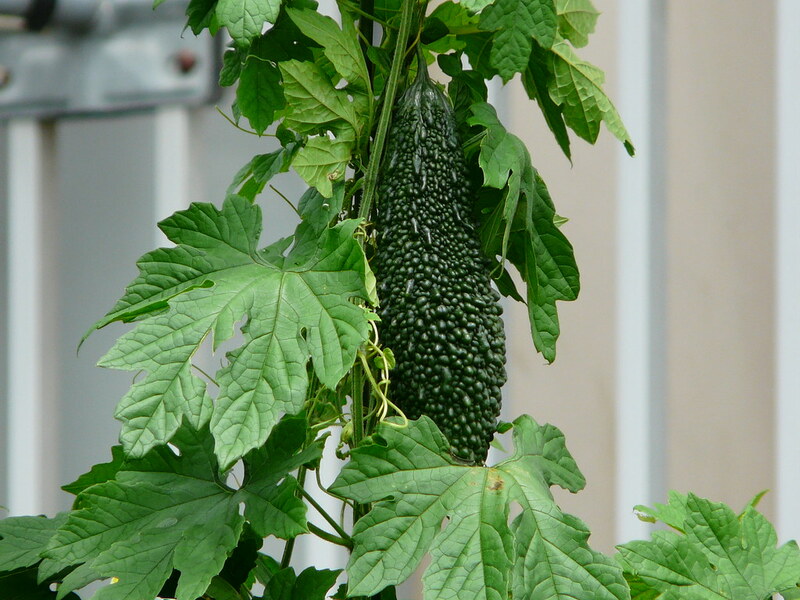 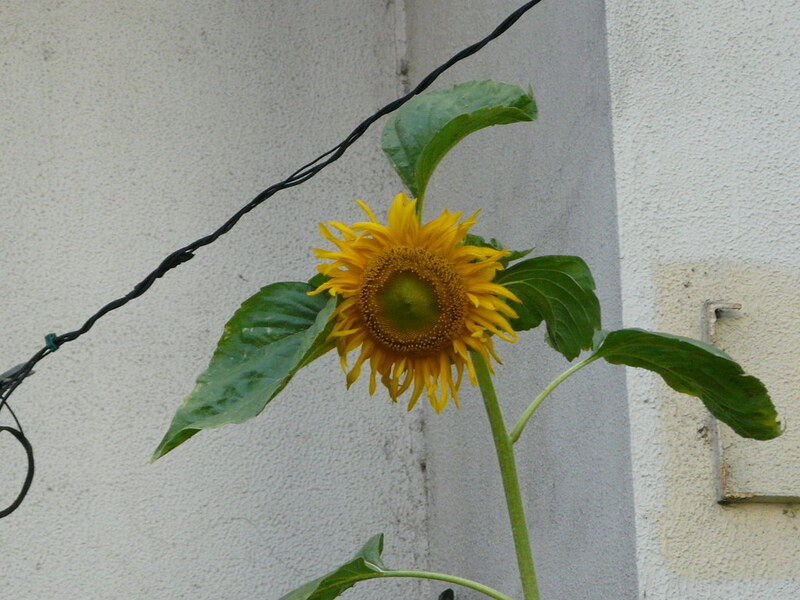 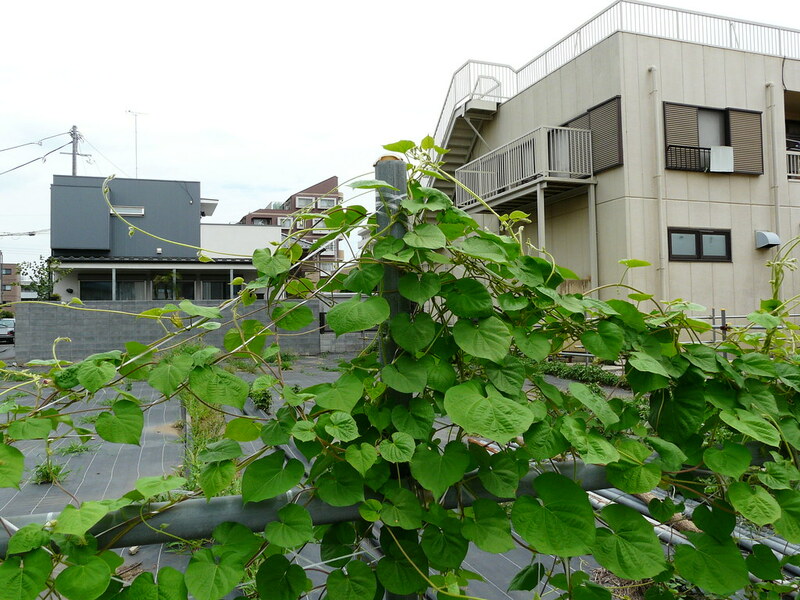 This goya is being trained up and over the pathway in front of the apartment building to the balcont of a first floor apartment. 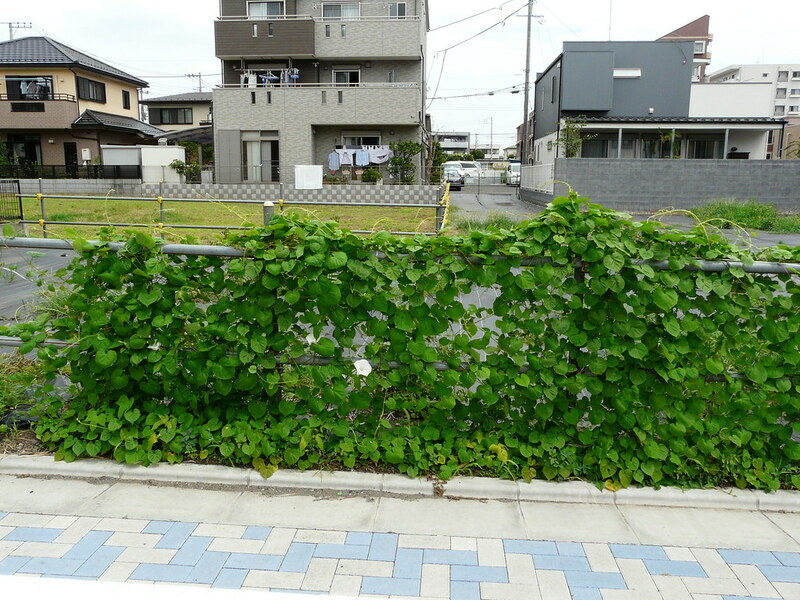 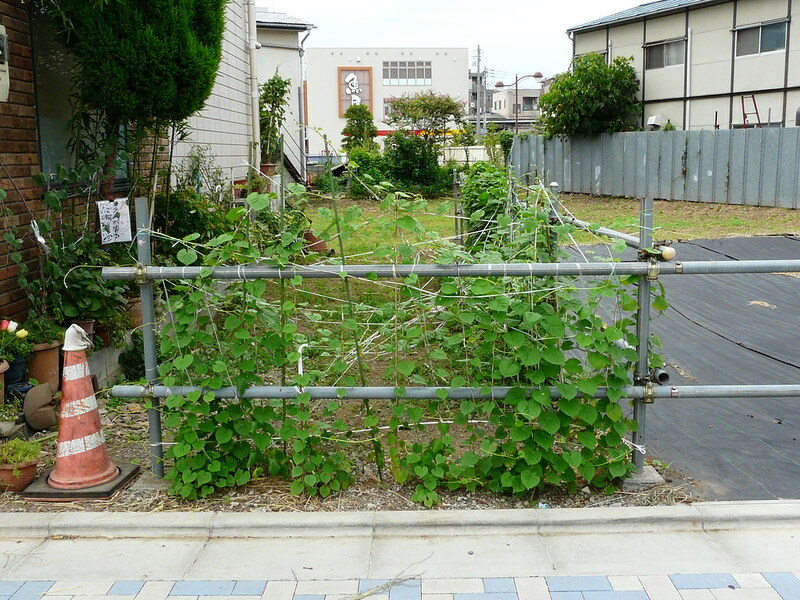 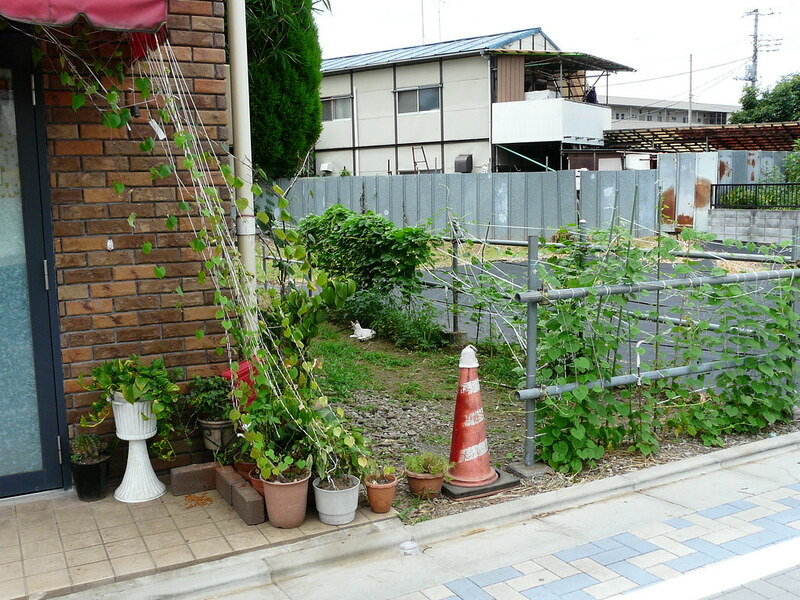 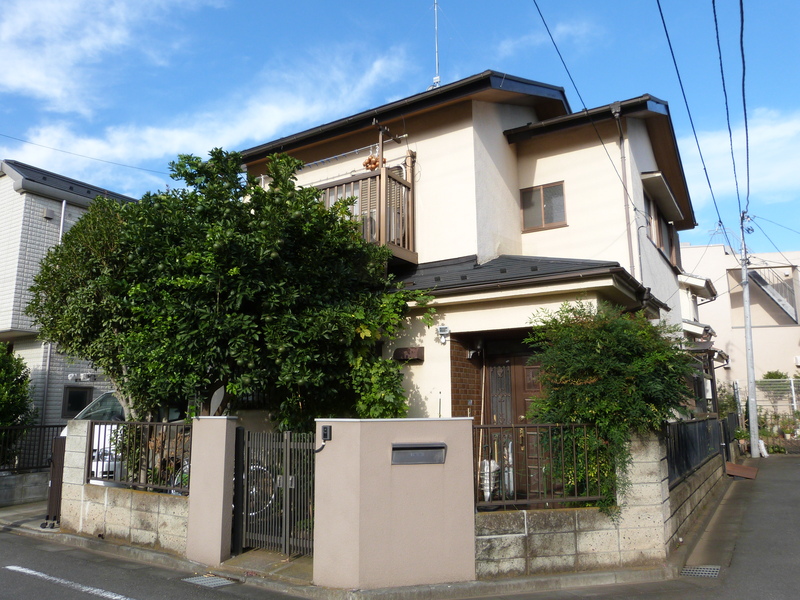 I like the way that the owner has not only appropriated the patch of earth in front of her residence but also created a physical (and visible to all) connection between the two. 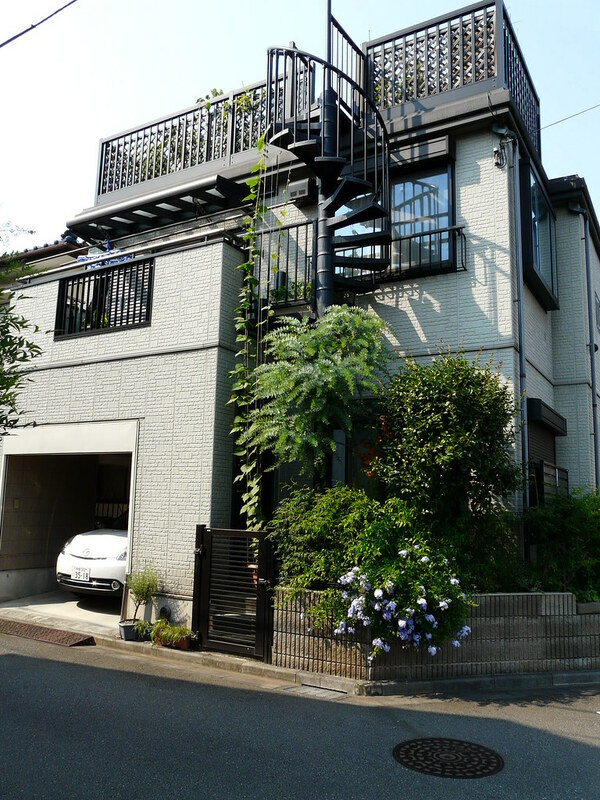 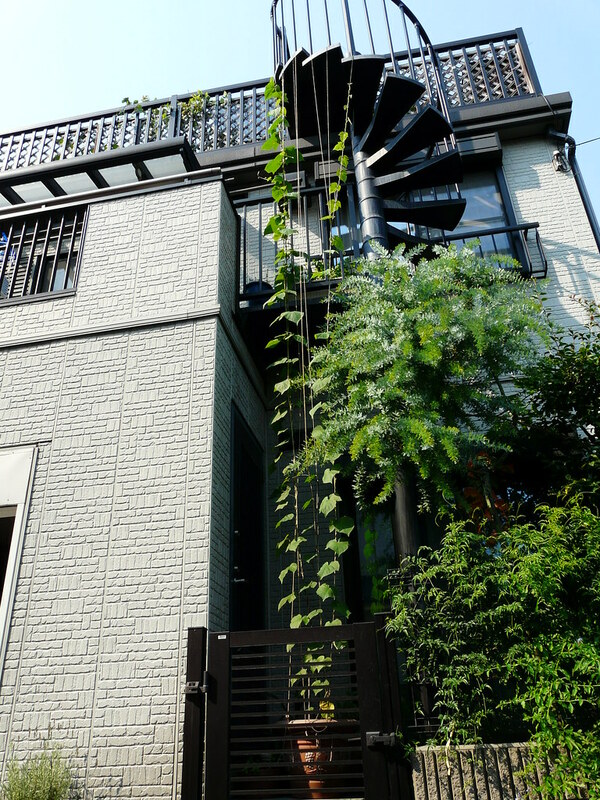 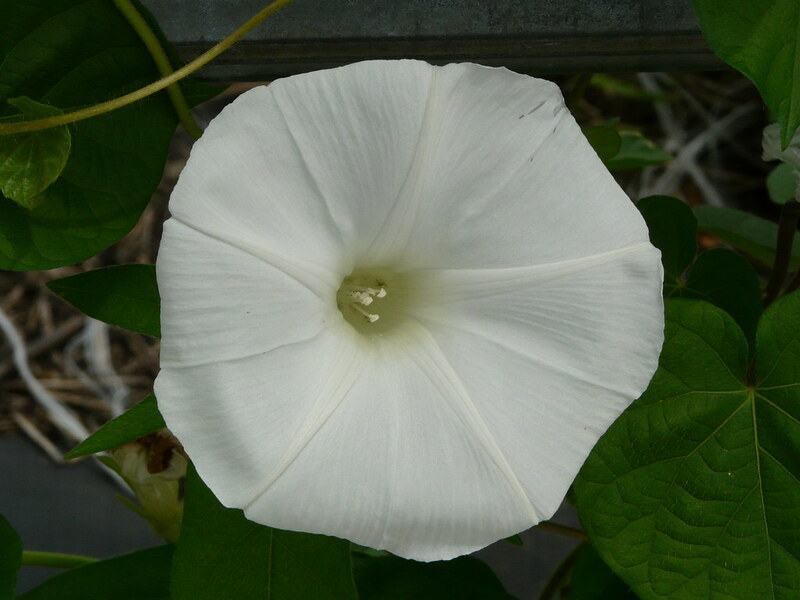 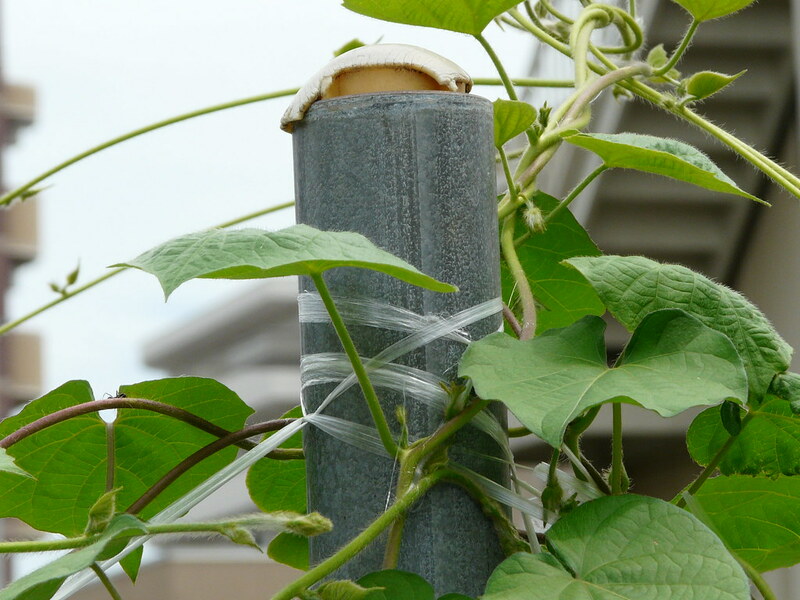 Plastic twine strung from the top an exterior spiral staircase to the fence below creates climbing structure for an asagao (Morning Glory). 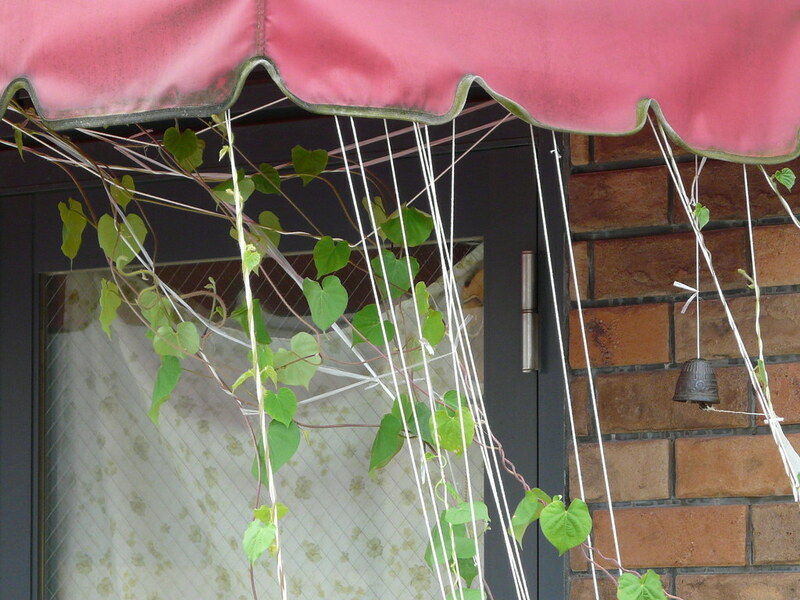 An interesting take on the classic balcony green curtain. 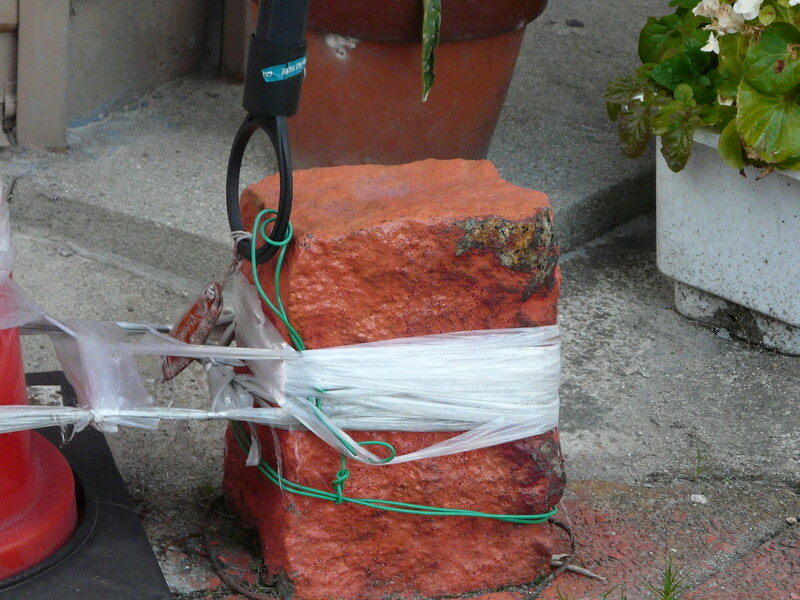 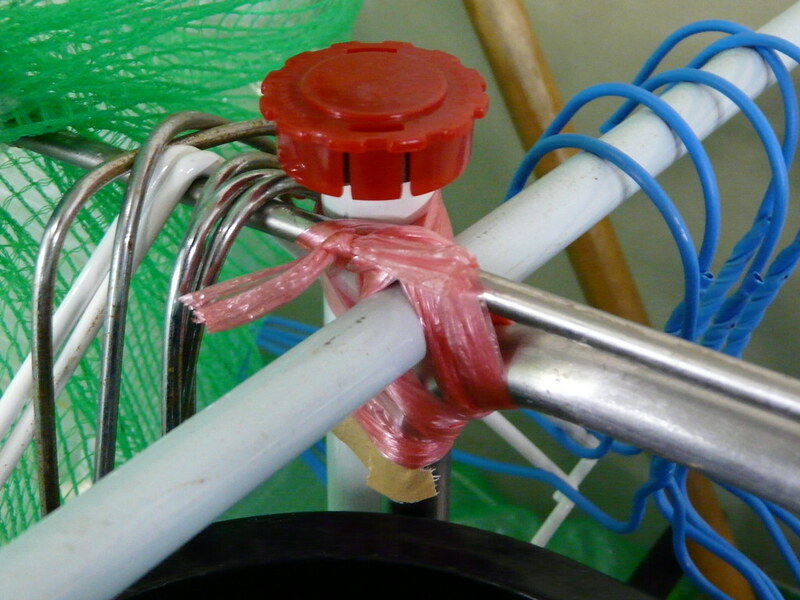 Another entry in the “security or stabilization?” series..[e.g. 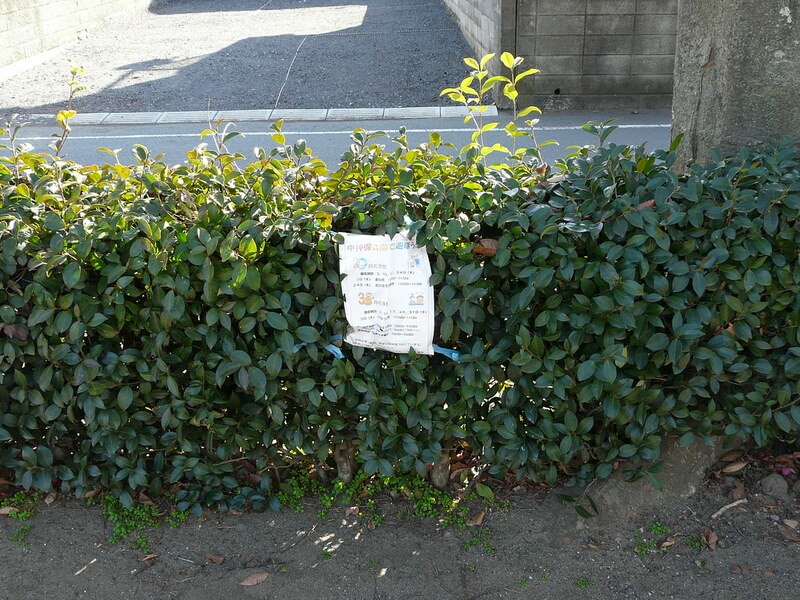 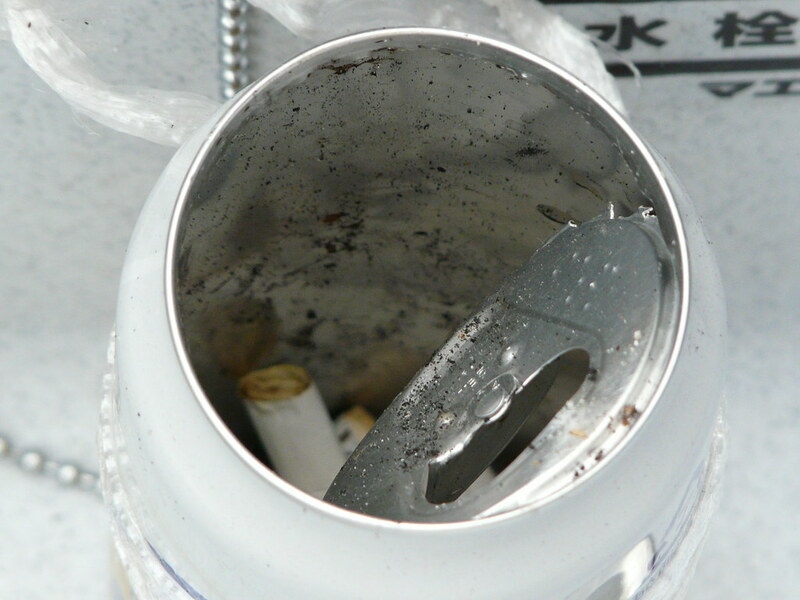 1], [e.g. 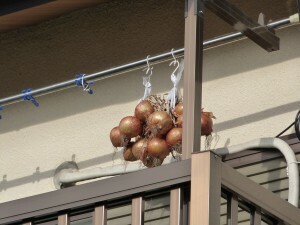 2].. 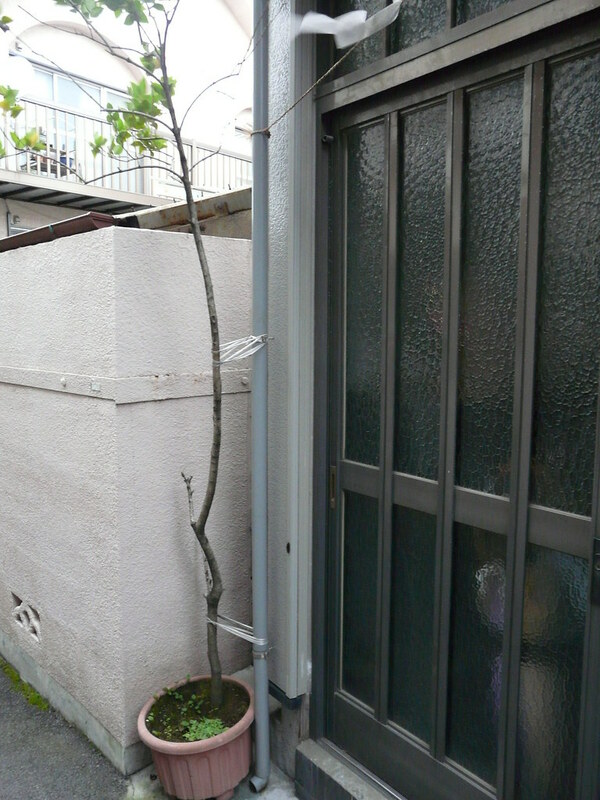 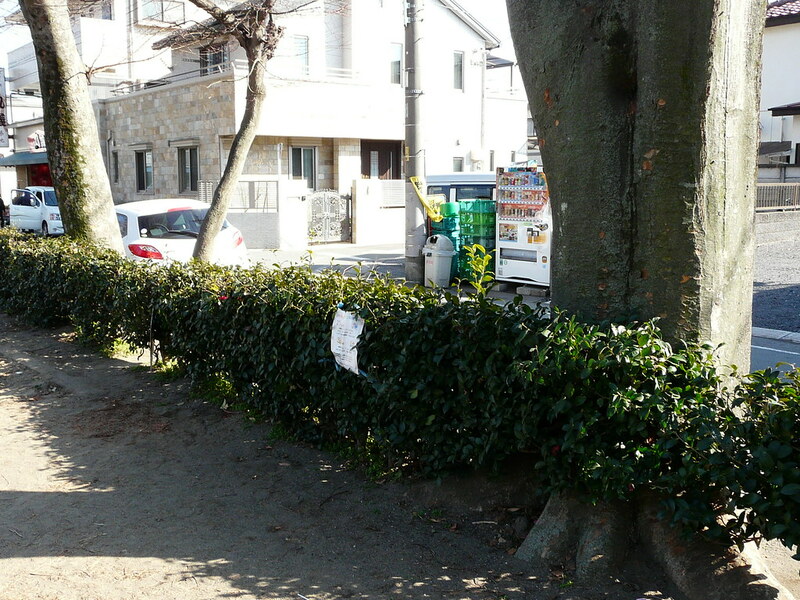 This one looks as if it is secured to keep the tree from obstructing the front entrance. 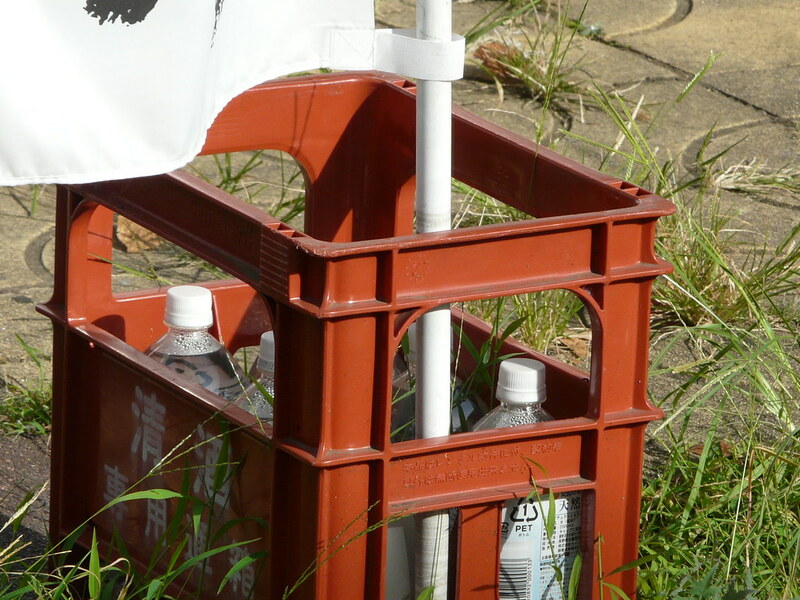 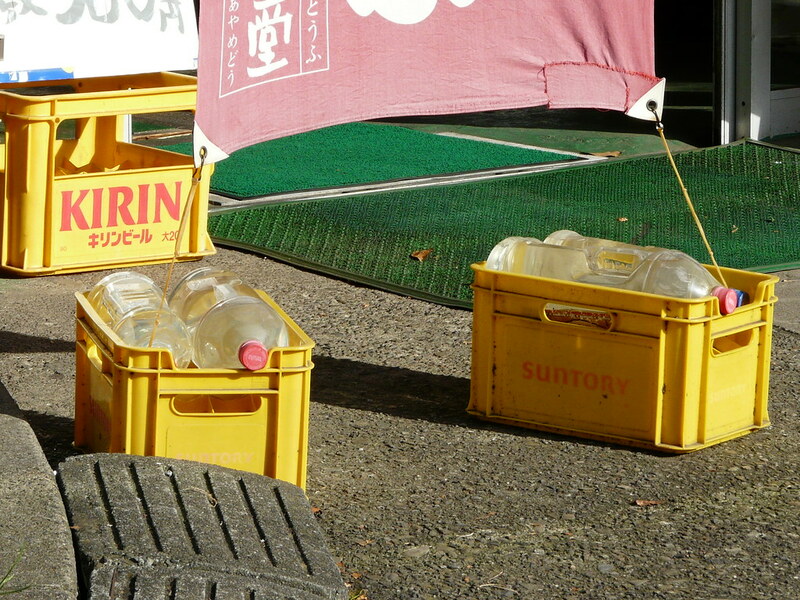 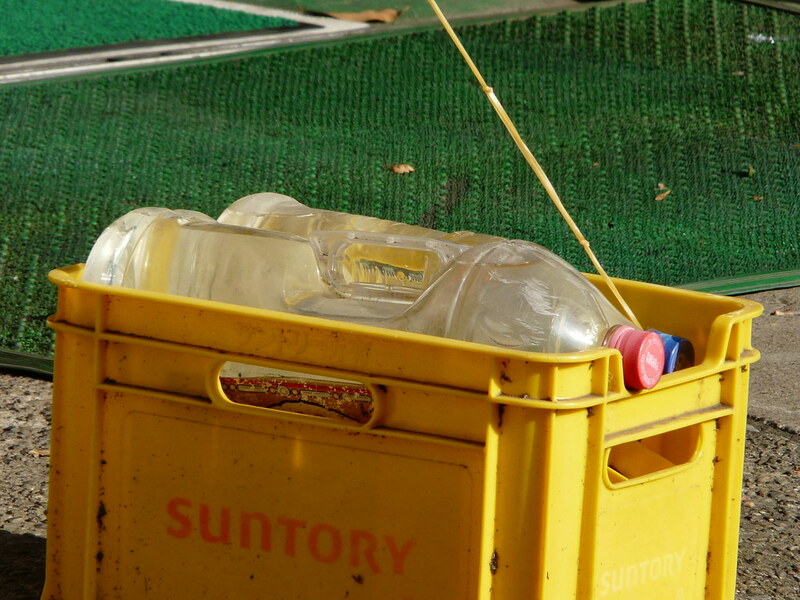 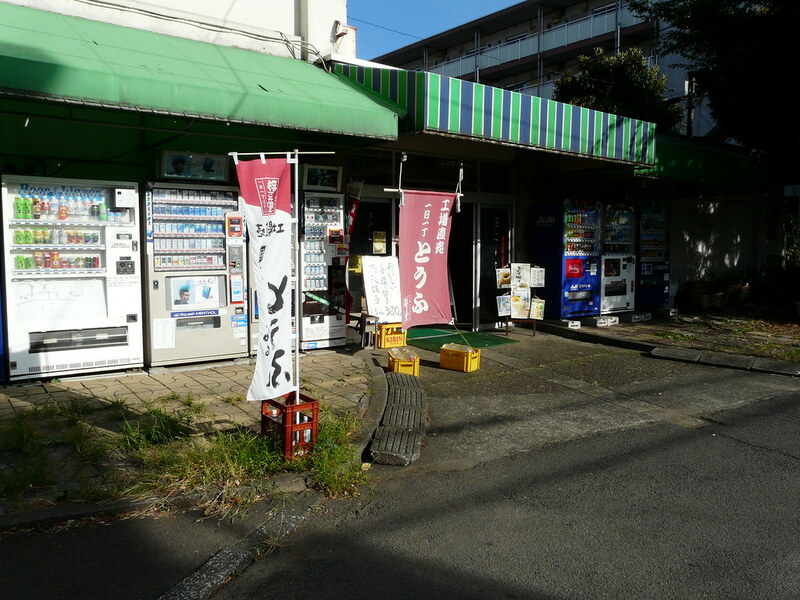 PET bottles (soft drink and shochu) filled with water secure a store banner and stabilise promotional flags.